We woke up early to make our flight that was scheduled to leave at 8:45am from Newark to San Juan, Puerto Rico. We only had a 25 min. layover but usually Cape Air flights never leave on time so I wasn’t too concerned. Unfortunately by the time we left the gate there was a lot of backed-up traffic at Newark. We wound up being 15th in line for take off. Needless to say we were over 45 min. behind schedule as we were on our way (finally) to Puerto Rico. Our flight was scheduled to leave at 1:09 and we landed in Puerto Rico at 1:10. 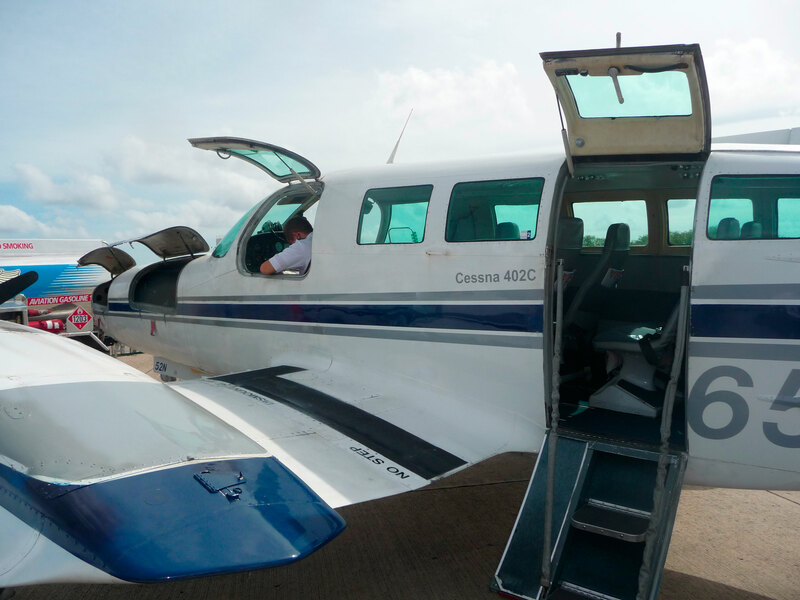 The flight crew allowed us to get off the plane first as we ran to the Cape Air gate. 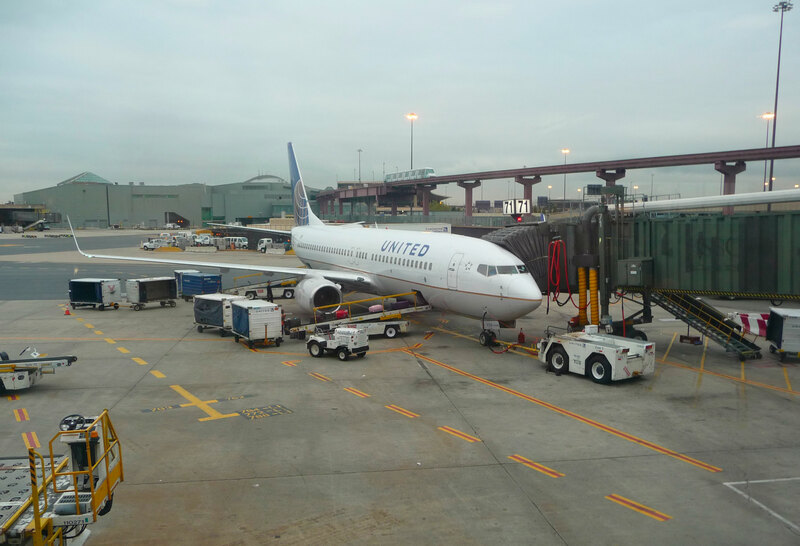 Once we got to the gate, we noticed that our flight had been delayed and didn’t leave yet – thank goodness! So we did make our connection, but obviously we knew that our checked bag would not. We landed in St. Thomas and met Bazille our taxi driver that Lisa @ Vacation Vistas arranged for us. He waited for us as we worked out the delayed bag situation with Cape Air. Eventually we were on our way to Red Hook. We managed to catch the 4pm ferry and notified Vacation Vistas. 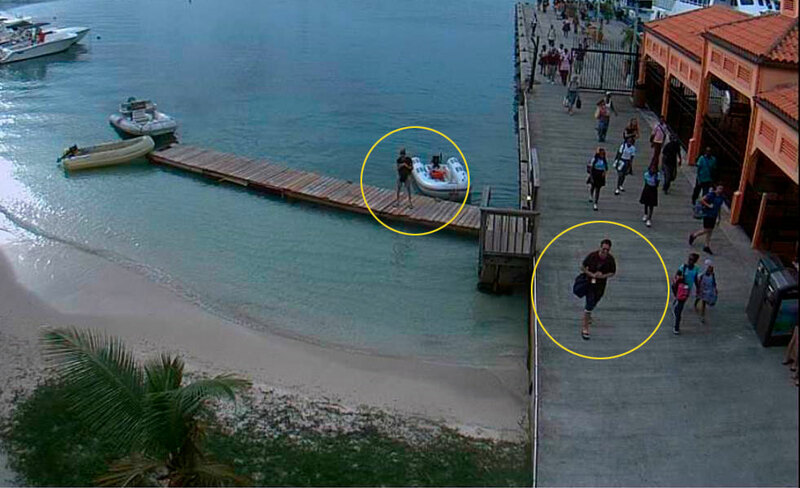 We arrived at the dock and I first made sure my sister could see us on the webcam. 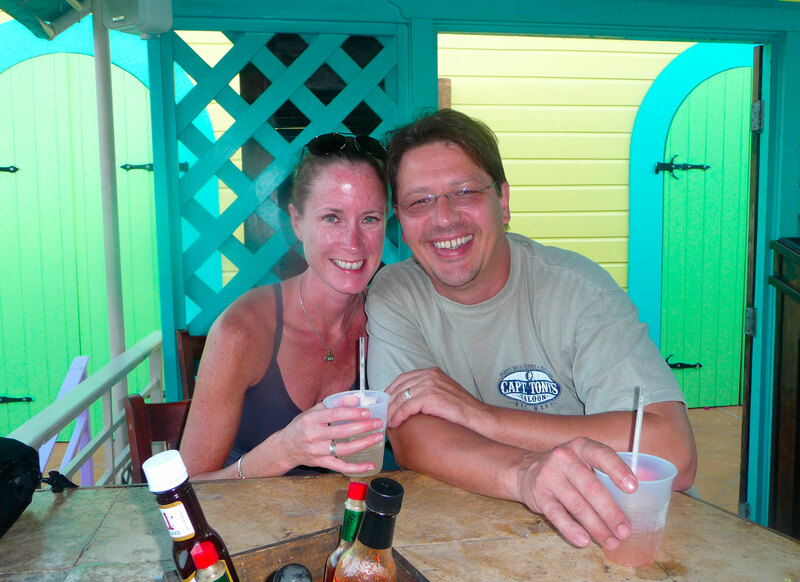 In addition, friends or ours were already on island so they were waiting for us at the dock with rum punches! We gave them a warm welcome and found KD the other Vacation Vistas rep. We told our friends that we would meet up with them later we got settled in our villa. KD took us to Bougainvillea Leasing so we could pick up our jeep rental. We got into the jeep and followed KD to our villa Wings Over Water. 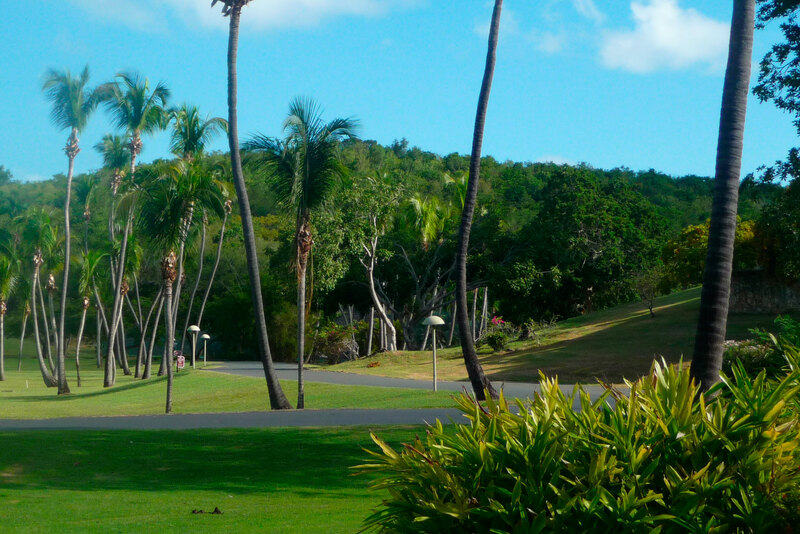 The drive overall was fairly easy and not too far from Cruz Bay. 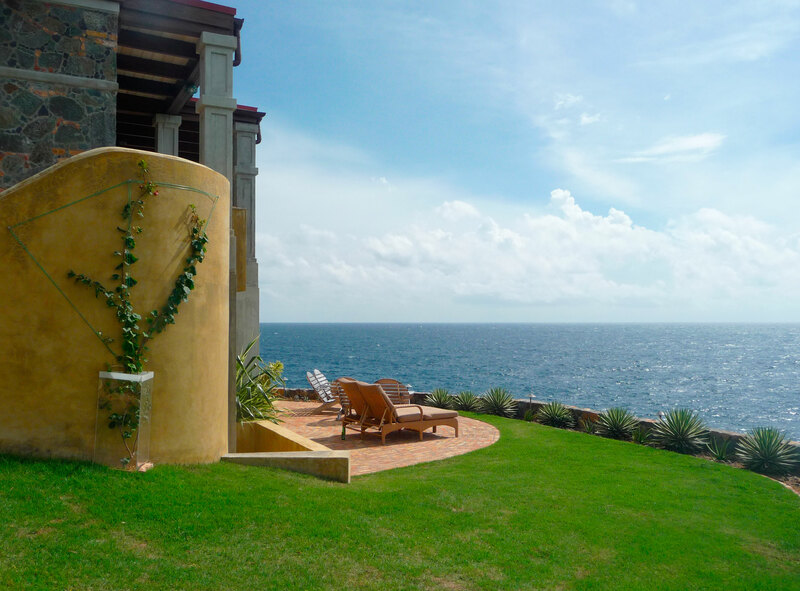 I was told that the driveway to the villa a “leap of faith”. Once we saw the entrance I realized what people were referring to. We pulled into the driveway and were blown away. 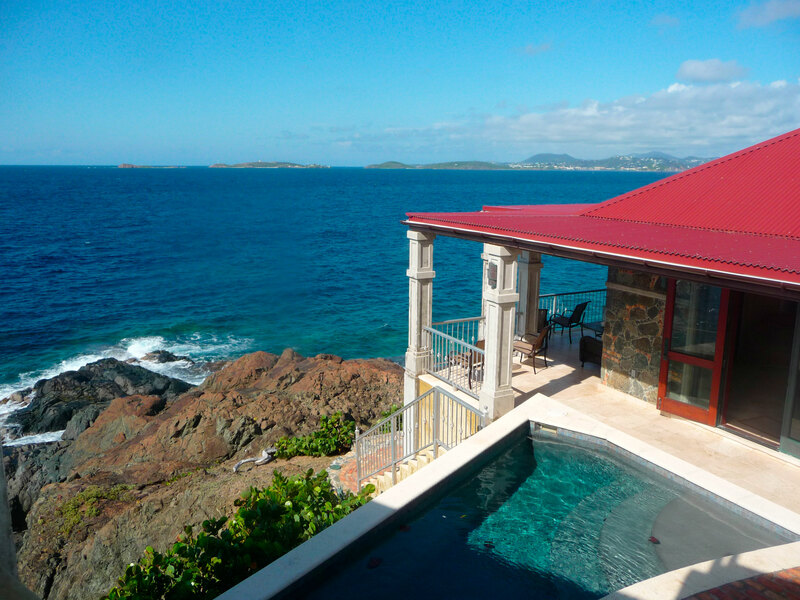 The location of where this villa is built on is mind blowing. It is set just off a rocky bluff. It took over 8 years to build and has only been on the rental market for a year and a half. KD showed us around and all of the provisions we ordered from St. John Catering. Vacation Vistas also had a nice welcome gift with some of their own provisions for us. Between the two we were pretty much set for the week! Luckily I did ship a box ahead of time to Connections that KD picked up for us with all our toiletries. We had an extra set of clothes and bathing suits on our carry on bags. 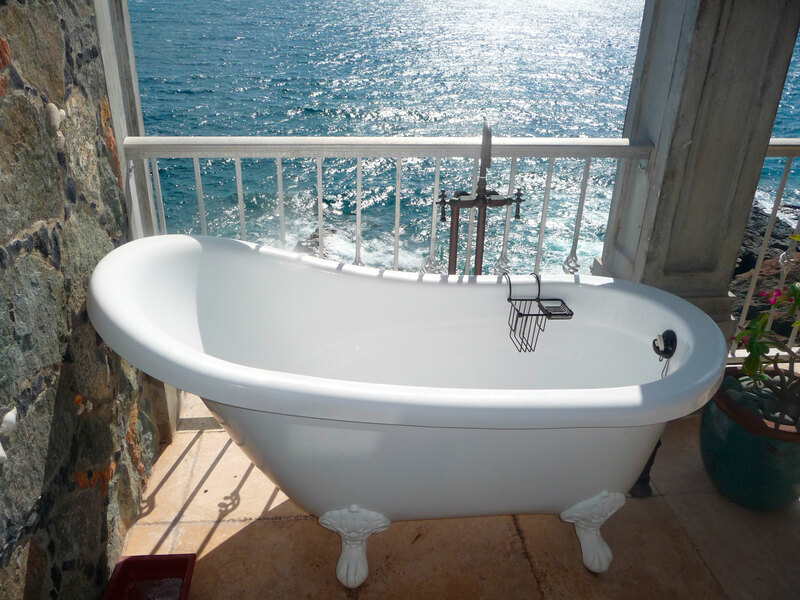 We each took an outdoor shower outside of the master bedroom. It was a bit breezy but felt refreshing. 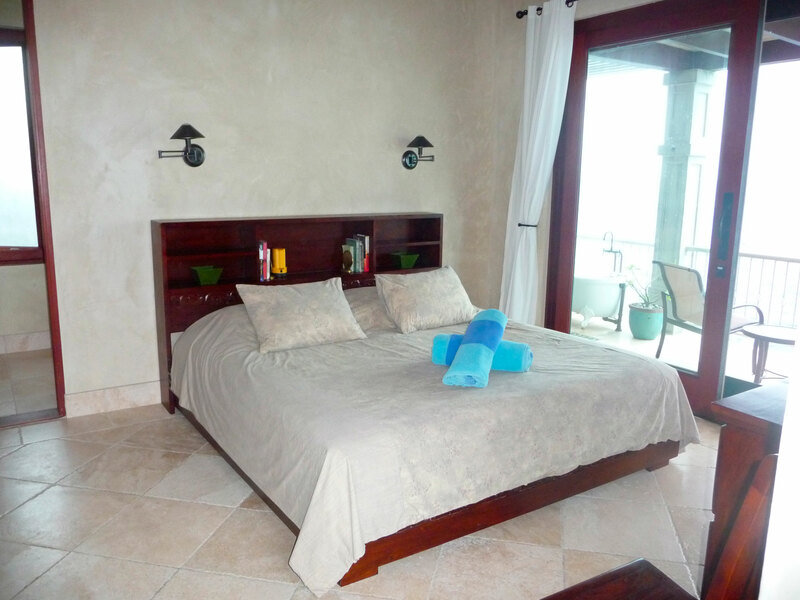 Note that if you have another couple staying at this villa with you, you can see the person showering…. Soon it was time to head into town and give Cape Air a call about our luggage. We were told that we should get it that night and I gave them my cell # to call. 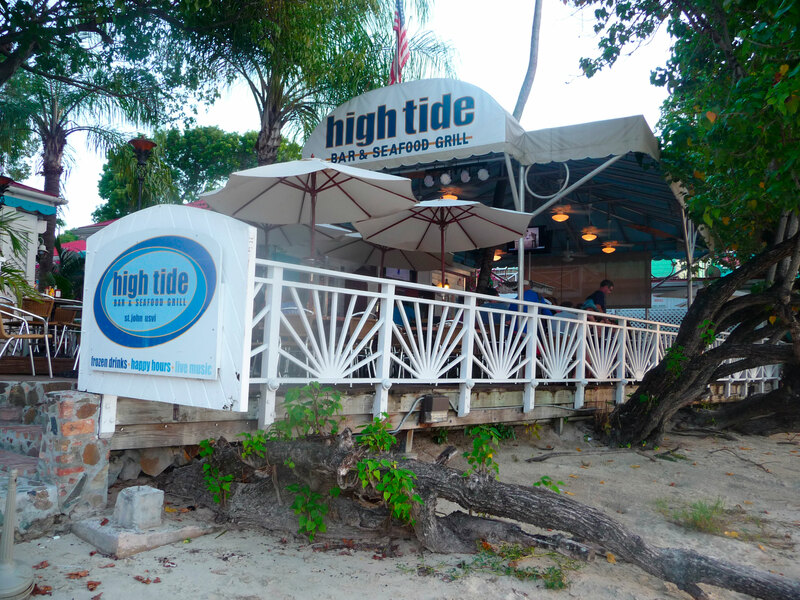 We met our friends at High Tide for some rum punches and appetizers. I tried calling Cape Air a few times while we were there, but no luck. We weren’t getting our luggage tonight. Overall, it was a good time and we got to see Inner Visions as well. After a long travel day, we headed back to our villa and said good night to everyone. Our first full day on St. John After a good night sleep we woke up to a very hot day with some moderate cloud cover. We started the day by making coffee that I also had shipped down from our favorite neighborhood coffee shop. I highly recommend doing this, because the coffee variety on St. John isn’t exactly plentiful or cheap. I cooked my husband and I up some breakfast while my husband contacted Cape Air again about our luggage. It turned out they had the wrong number for my cell phone (off by one digit) and tried calling us last night! After straightening everything out with him, we were told that our luggage would be coming over on the 10am passenger ferry. As a side note, if you have luggage tags on your bags, be sure to have your cell # on the tags vs. your home #. 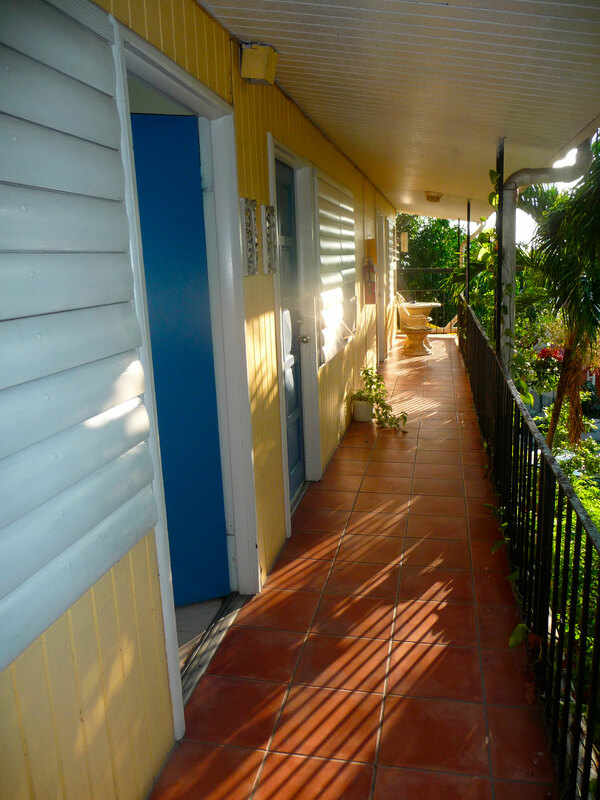 When we got home we had about 4 voice mail messages from Cape Air – so they did try and contact us that evening. We headed to Cruz Bay to wait for our luggage. About half way there, my phone rang and it was the guy who was sending our bag over. He said he had a flat tire and wouldn’t make it until the 11am ferry. 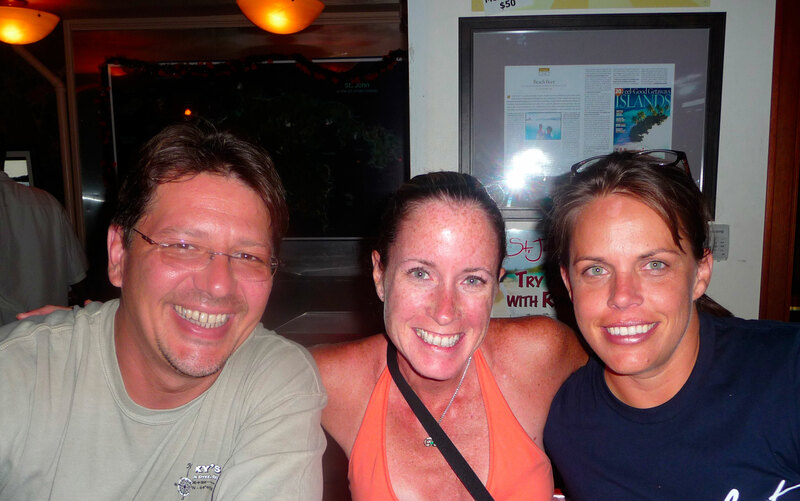 Plan B – we wound up meeting our friends at JJ’s. To kill some time, we did some shopping and hit St. John’s Spice to grab a few bottles of Jerome’s hot sauce. It was getting hot out and we were getting thirsty. 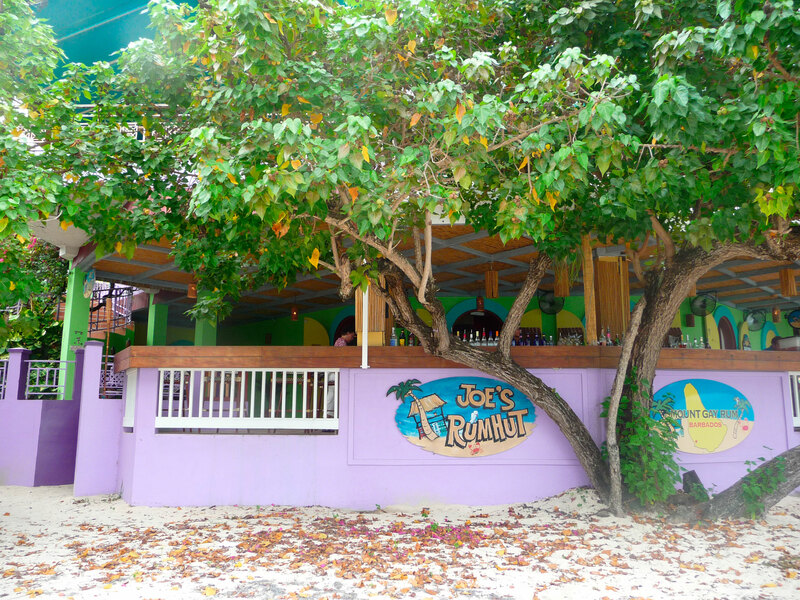 We walked town to Joe’s Rum Hut. They weren’t quite open yet, but they were able to accommodate us a little early. The 11am ferry finally showed up around noon. I was pretty happy to see our big blue bag come off the ferry. With our bag in tow, we headed back to the villa. We figured that we would meet back up with our friends for the 3rd annual Woody’s Save Second Base. 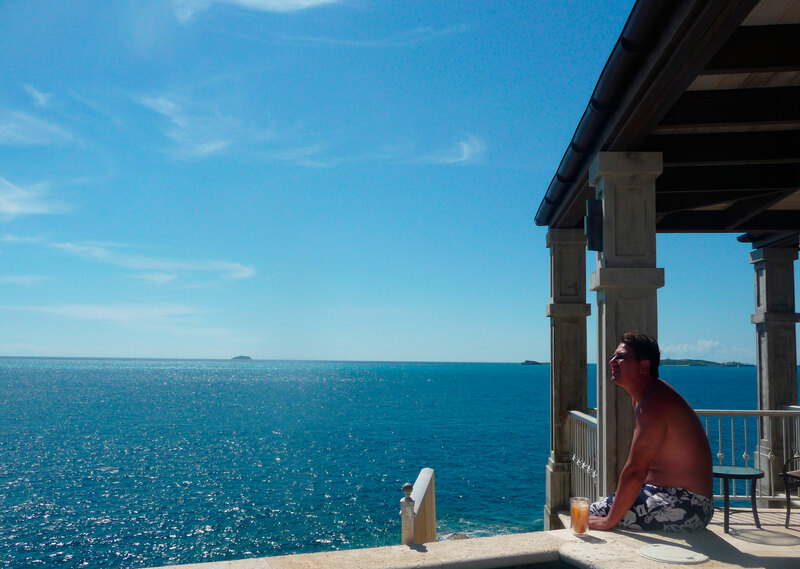 The afternoon was spent relaxing at our villa and enjoying the views. 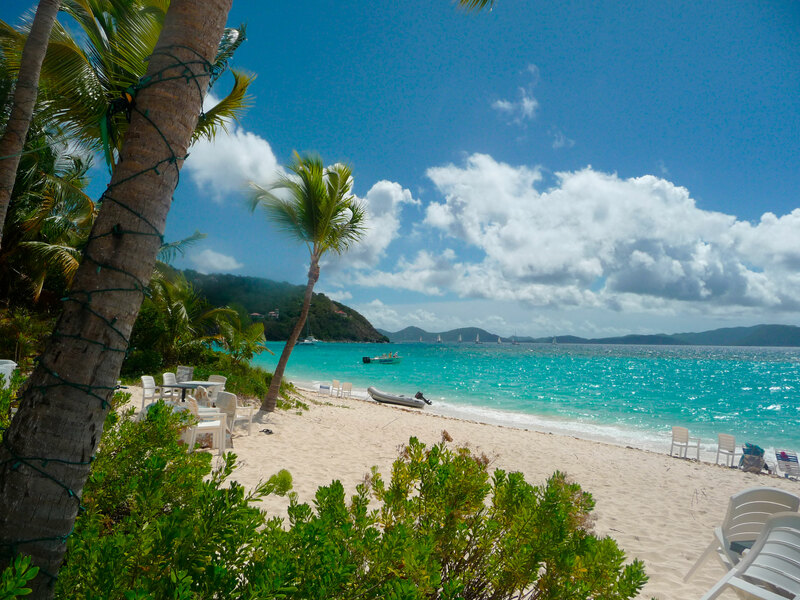 Soon enough it was time to head to Cruz Bay. We parked our jeep at the Bougainvillea Leasing/Amore Center and walked down to Woody’s. The road was completely blocked so you could stand in the street. They had a great turn out and it was a lot of fun. We also got to here Inner Visions play again. It was a fun time and eventually we had to make our way back to the villa. It was our friends last night so we wished them a safe trip home. 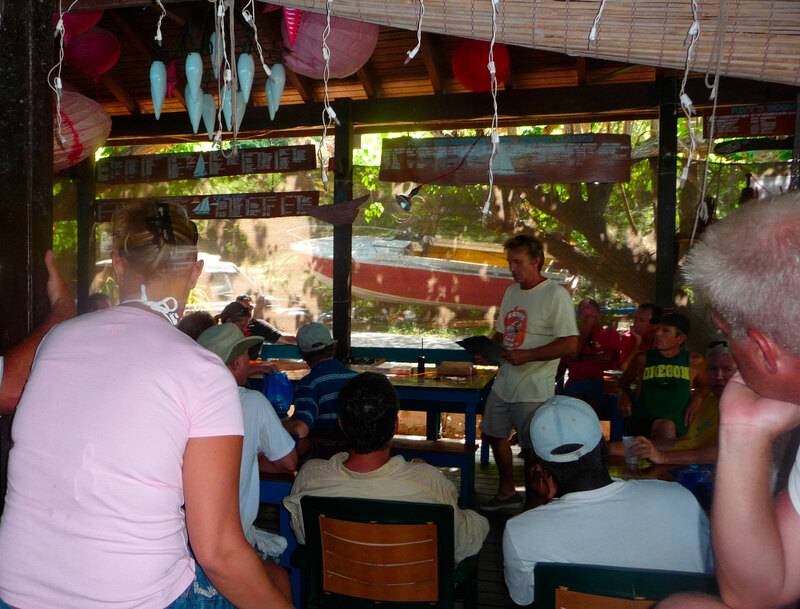 Last year we joined our friend Captain Joe aboard the Scubadu during the Cat Fight. 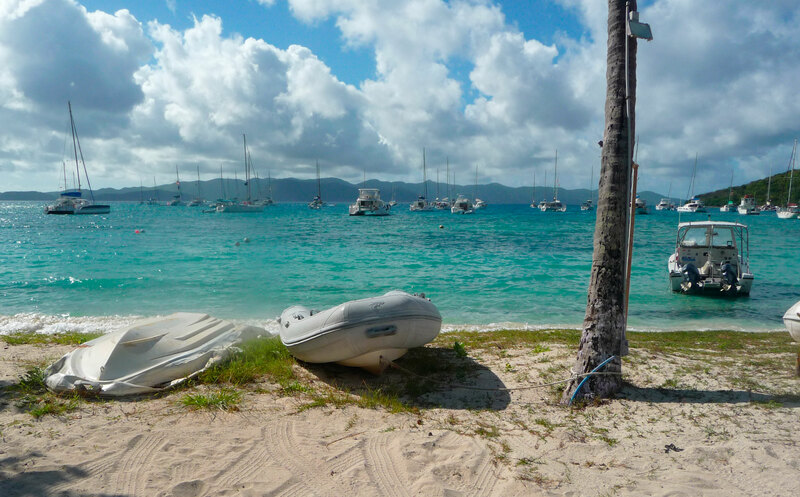 This year we wanted to go over to Jost but spend time on the island. We woke up around 7am and drove to town. 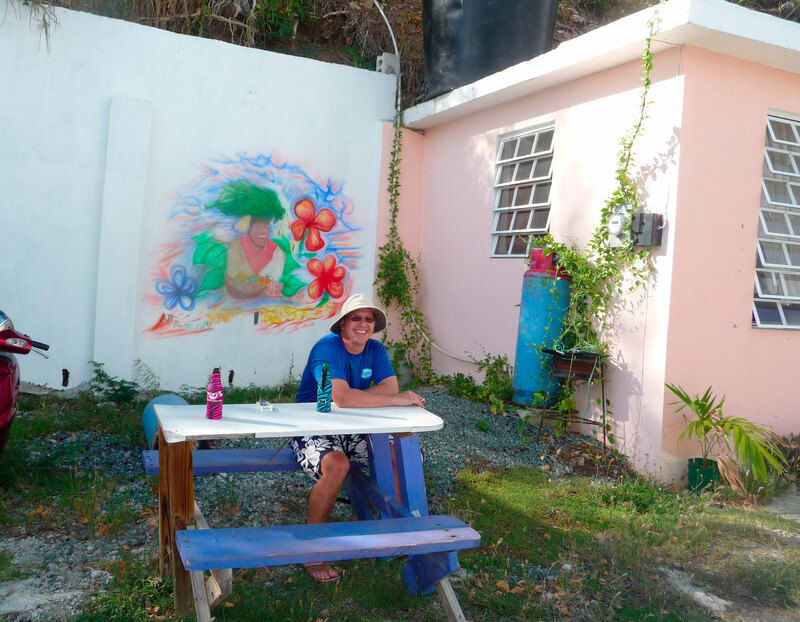 It wasn’t time yet to check in at the Inter Island Water Ferry to take us over to Jost, so we stopped by at Jake’s for a quick and very good breakfast. We walked down to check in and grabbed our tickets to the ferry. It took us about 30 – 40 min. 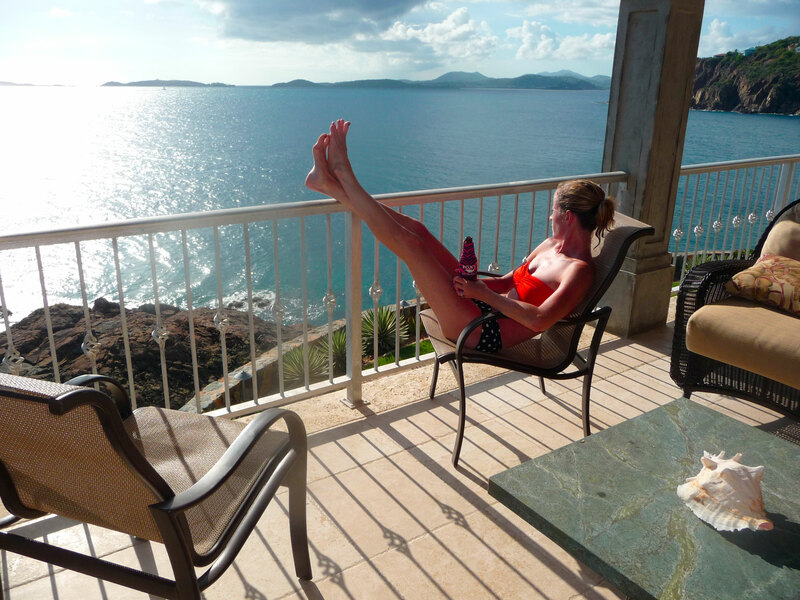 to get over to Jost. 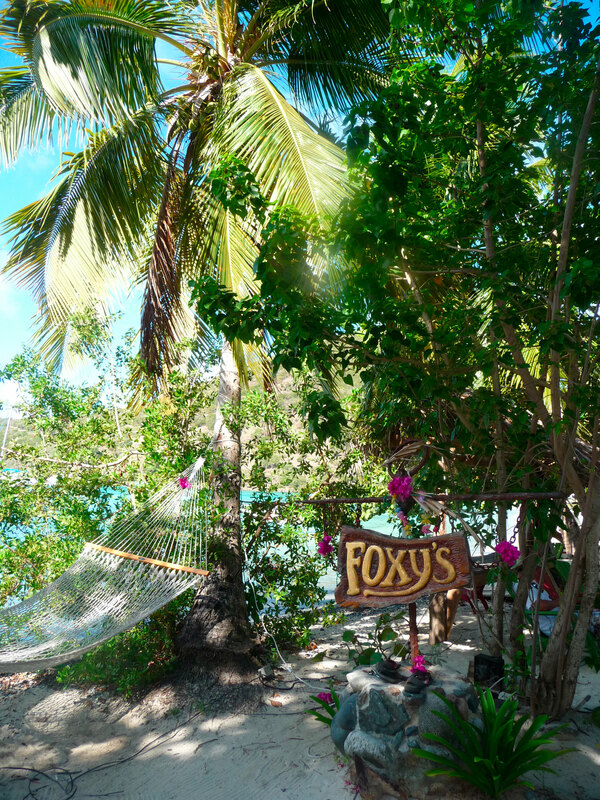 After checking in, we headed to Foxy’s. It was getting close to the Cat Fight check in time so we walked over by the dock. You could see all the catamarans getting ready for the race. People were coming over in their dinghy’s and we spotted Captain Joe! It was great to see him. He invited us to come on board for the race but we declined and wished him good luck. 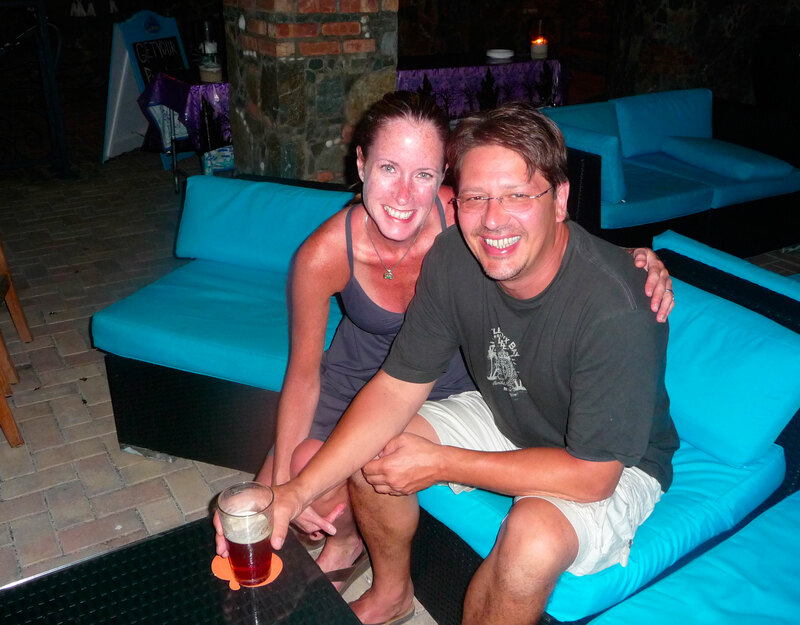 Once everyone left we grabbed a couple of beers and waited for a taxi to take us over to the Soggy Dollar Bar. I started to wonder if we would see a taxi but eventually one came by. I asked the driver if he could take us over and he said he just needed to take care of something first and would be back to pick us up. 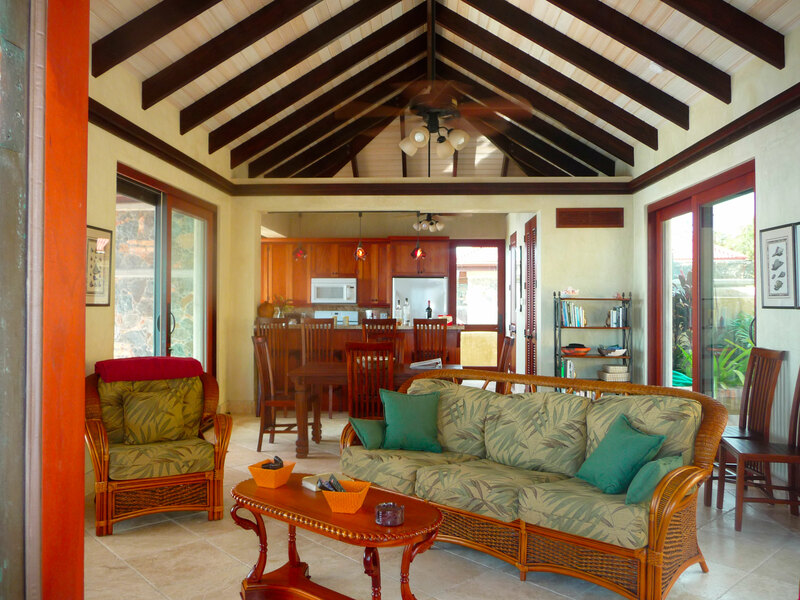 It turned out that he was one of Foxy’s sons who runs the Perfect Pineapple on Jost and there was a problem with the pipes at his small hotel. He was trying to get a hold of the person who had the supplies to fix it, but he wasn’t answering his phone. He came back to pick us up and then had to make one more stop. He stopped and found the guy. 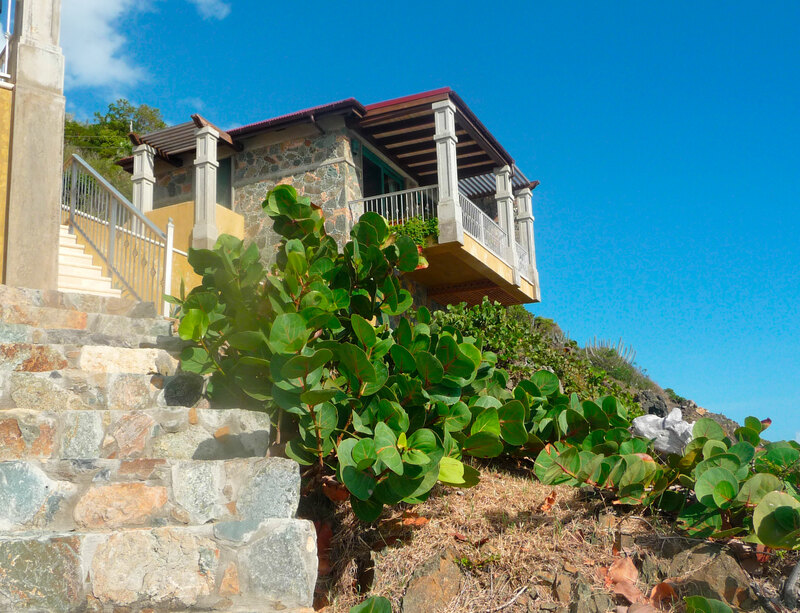 It turned he wasn’t answering his phone because he was drinking a bottle of rum – you gotta love the islands! After he got what he was looking for, he made a quick stop at the Perfect Pineapple to drop off the supplies. 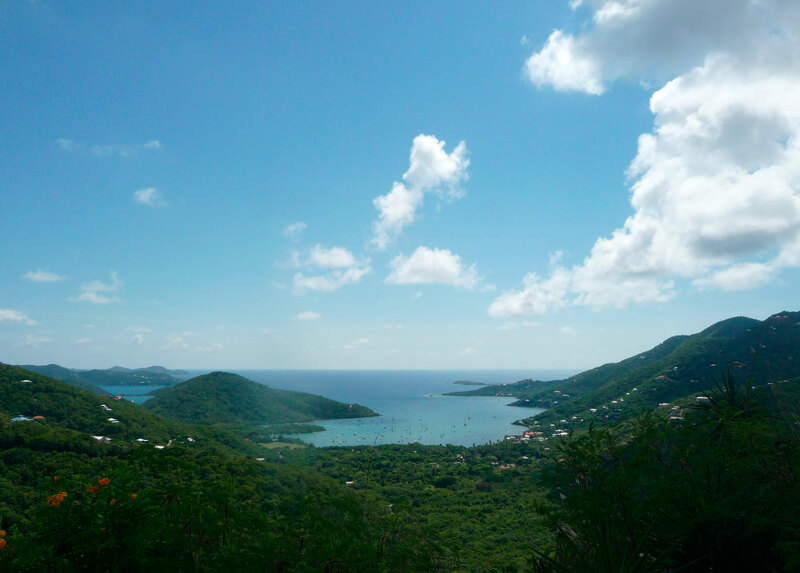 On the way, he stopped so I could take a picture of the beautiful overlook of White Bay. 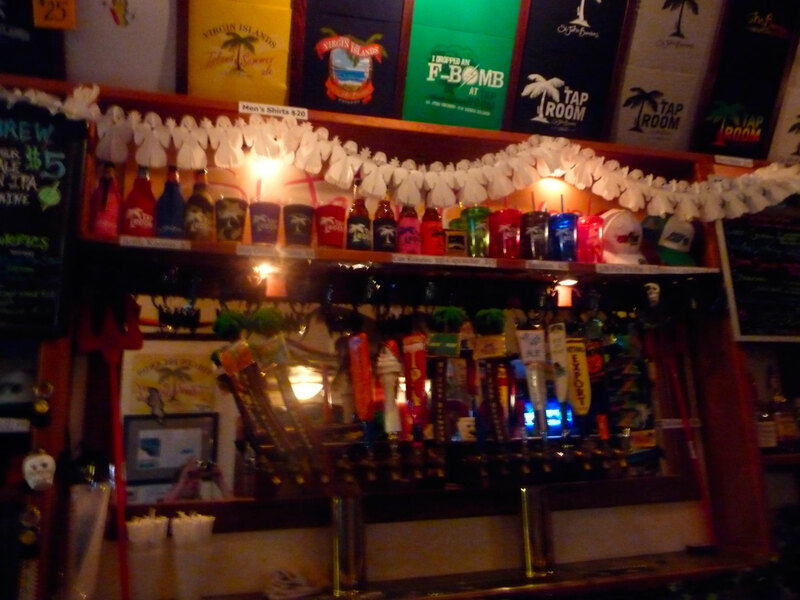 Within minutes we arrived at the Soggy Dollar Bar. I asked him if he could pick us up at 3pm and he said it wasn’t a problem. My husband asked him how much for the taxi, but he said not to pay him until he takes us back – which I thought was very trusting. The weather was beautiful to spend the day on White Bay. 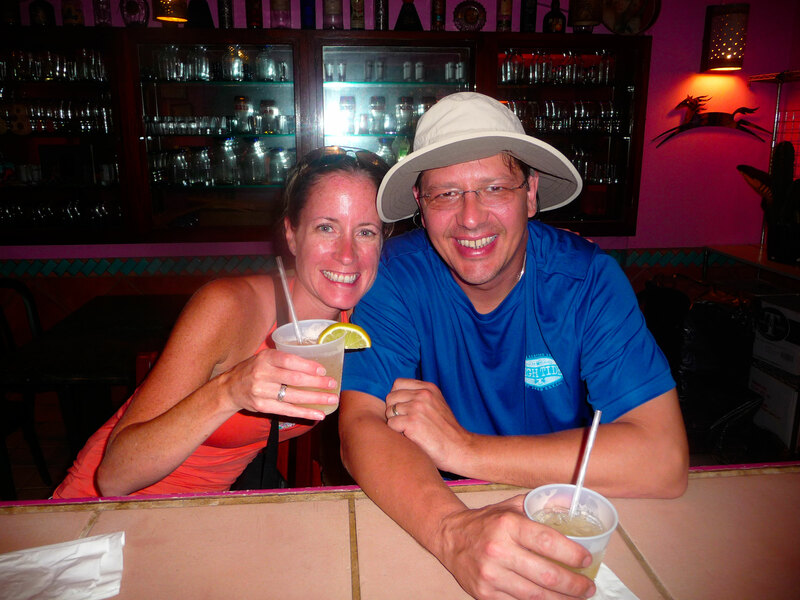 It was also the first time we ever arrived at the Soggy Dollar Bar dry and with flip flops on! We could see the catamarans in the distance as they raced all day. We picked a nice table in the shade and chatted with other visitors also enjoying the day. We took a few breaks and went into the water to cool off in between a few painkillers and some snacks. Soon it was time to check and see if our taxi driver was there. Around 5 min. to 3, I checked around back and sure enough he was waiting. We grabbed our things and we headed back to catch the 4pm ferry. On the way back, a commercial for the Perfect Pineapple came on the radio, so he raised the volume and listened to it. We told him we approved of the commercial and he was pretty happy. Once we got to the ferry dock, we thanked him for taking us back and wished him luck with fixing his place. We didn’t see anyone waiting for the ferry, or a ferry yet, so we walked into the little market near the ferry. We grabbed a few beers and sat down and waited. 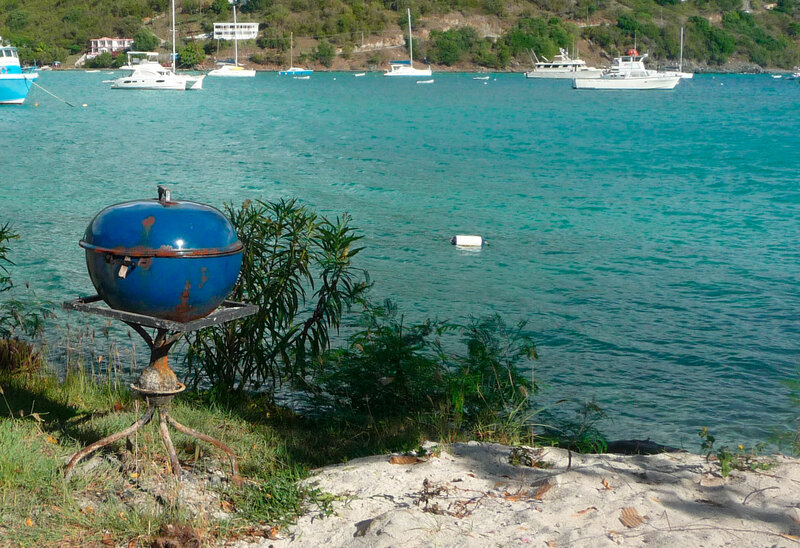 We had a nice view of a blue grill which was a bit odd, but maybe it was used by the same place. It was getting closer to 4pm, no ferry and I was starting to get nervous. My husband got up and walked around to where you would check in and sure enough there were people there waiting. A few minutes later we see the ferry pull up. Everyone got on board and we were on our way. 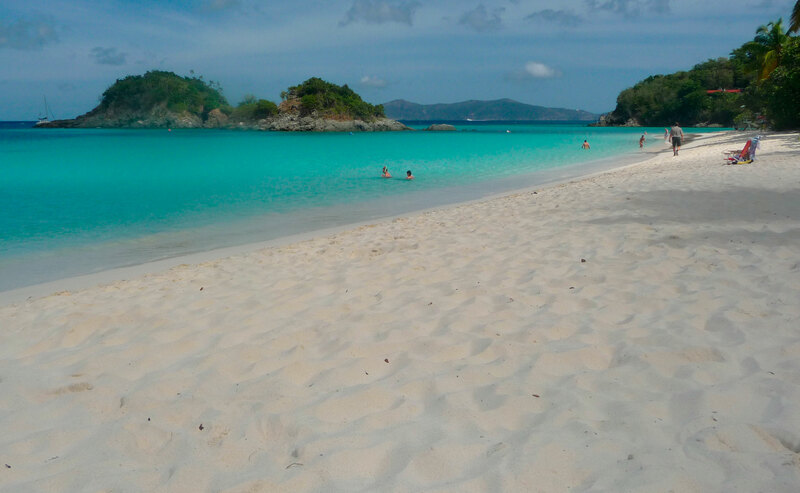 We wound up making a stop on Tortolla before going back to St. John. The ride back was longer then the ride there. We pulled into Cruz Bay a little after 5pm and checked in through US Customs. Being that we were quite hungry and didn’t feel like cooking, we walked up to Margarita Phil’s. We had a couple of margaritas while they prepared our order. I ordered the grouper burrito and my husband ordered the beef burrito. dinner and shortly after that we were exhausted. Time to turn in for the night. 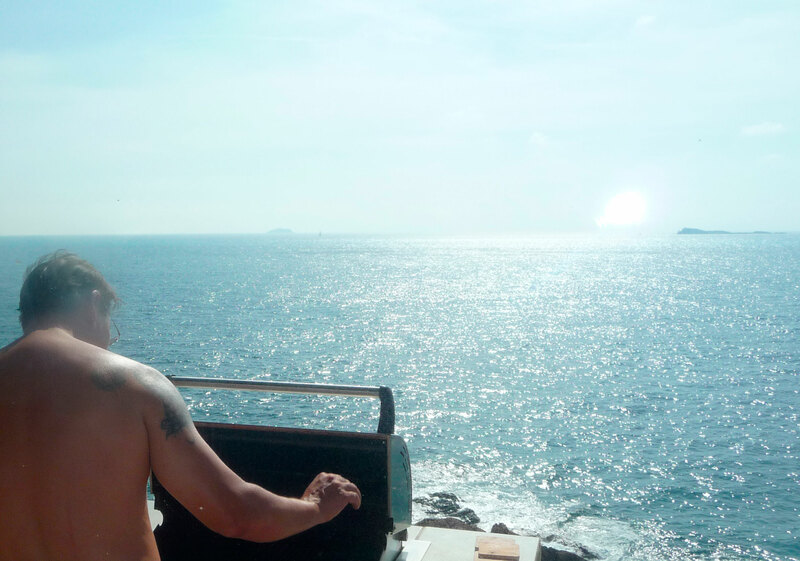 We woke up to another beautiful day and gave Vacation Vistas a call to see about our grill. We had someone come by and he said that he needed to change the propane tanks and it wouldn’t be for a few hours. We said it wasn’t a problem since we were headed out to one of the North Shore Beaches. While we were getting ready in the morning we called back to the states to check in. We heard that this potential “Frankenstorm” was more and more going to become a reality. We made sure we gave them the land line phone # at the villa so they could reach us. As we set out to the North Shore beaches, I had my heart set on going to Francis Bay. 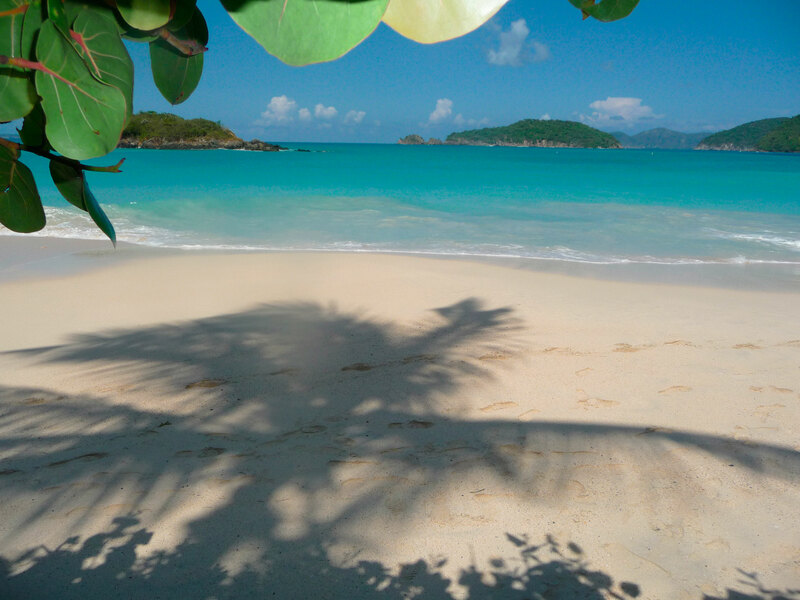 We have never gone to this beach and I have seen pictures of it. We passed Caneel, then Hawksnest and then as we neared Trunk Bay, I noticed the parking lot was practically empty. Since we hadn’t been to Trunk in a couple years we decided to spend the day there. My husband grabbed his kindle, while I grabbed my snorkel gear and went into the water. The water was a little cloudy, however I was able to see a lot of fish as I got closer to the cay. I even saw a stingray go by. 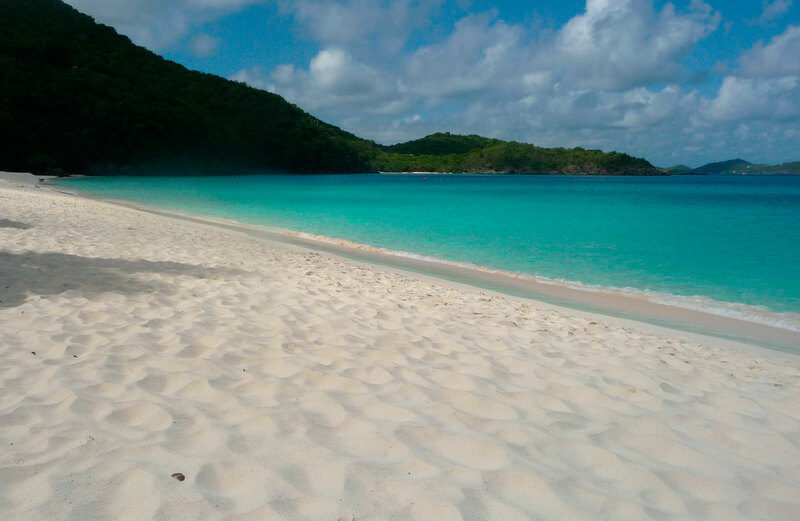 It was a beautiful day spent surprisingly quiet on Trunk Bay. Being that my husband and I are Giant fans, we wanted to get back to the villa to watch them play the Cowboys. We made it back in time and watched a great game. My husband grilled up some bacon wrapped pork tenderloin from St. John Catering with grilled green and yellow squash. We continued to see the news regarding the hurricane and couldn’t believe it. 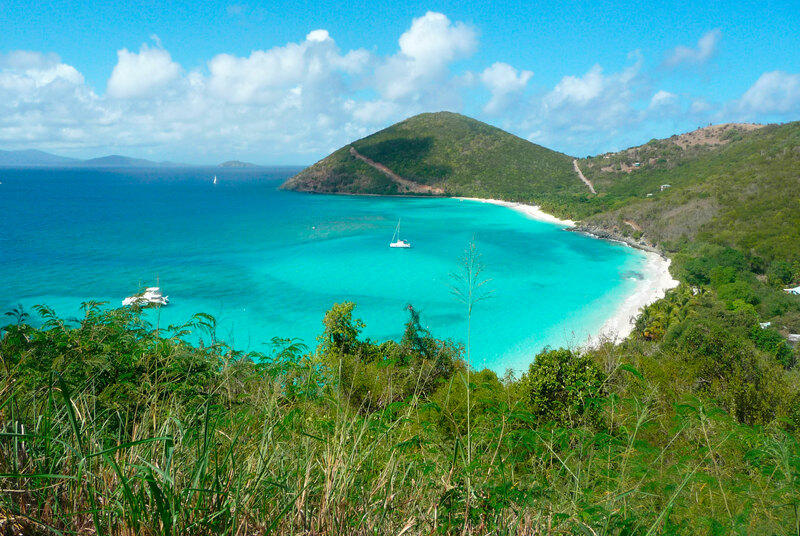 We were on St. John the year before when a freak snowstorm hit the NJ area. It was unbelievable to think that we would be missing another bad storm TWO YEARS in a row. After a nice day it was time to go to bed. We woke up to another sunny day and I was getting excited to try Francis Bay this time. I cooked us some breakfast while we watched the news. The hurricane was scheduled to hit that night. I called my sister and she said that they were prepared as best as they could be for the storm. She checked on our cat and also gave our key to our neighbor in case she couldn’t make it back to our house the next day. We made the drive back up the North Shore Road and passed by the beaches. We noticed that Hawksnest was empty and so was Trunk, followed by Cinnamon. We were kind of perplexed by this as we drove closer to Maho. As we drove by Maho, the water was coming up onto parts of the roadway. There was literally no beach – at all. We couldn’t believe it. We drove further and made it to Francis. We got out of the jeep and it was the same story. The waves were covering the entire beach. We met up with another couple and they said the same thing that all of the North Shore beaches have a high surge due to the hurricane. You could also look in the distance and see white caps. We have never seen anything like it before. A bit disappointed we figured we would go back to town. 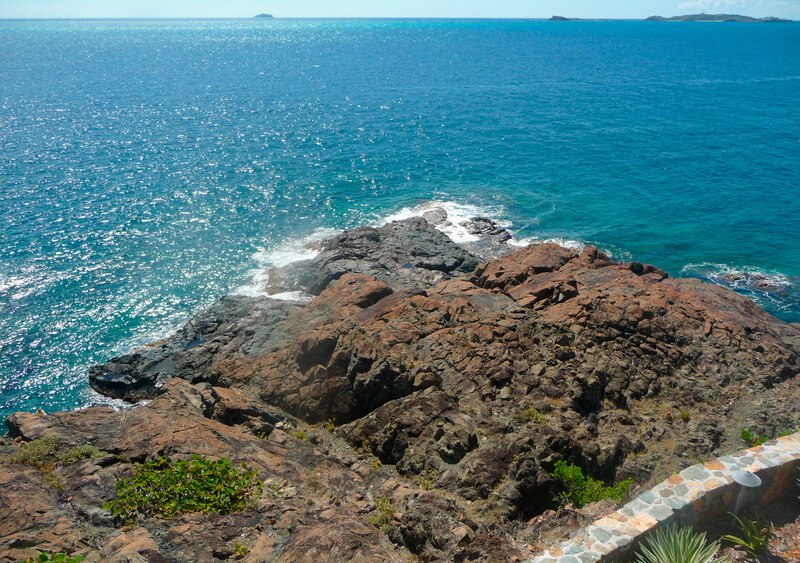 We stopped at the Trunk Bay overlook and took a few pictures of the high surf. On the way back we stopped at Mongoose Junction. I realized my memory card on my camera was nearly full and needed to buy another one. We stopped at the new watersports store I believe was called Everything Beach but they didn’t have any. We walked around a little and stopped at the Sun Dog Cafe for a cold beverage. I heard about the new Motu bar and was on a quest to find it. It wasn’t too hard to find if you just make a right when you leave the Beach Bar and head down past the new Terrace Restaurant. The bartender was just opening up and we ordered a couple of Virgin Islands Pale Ale. I had the mango ale and my husband had the IPA. It was a nice location and different view from what we were used to. We thanked the bartender and drove back to Wings Over Water. 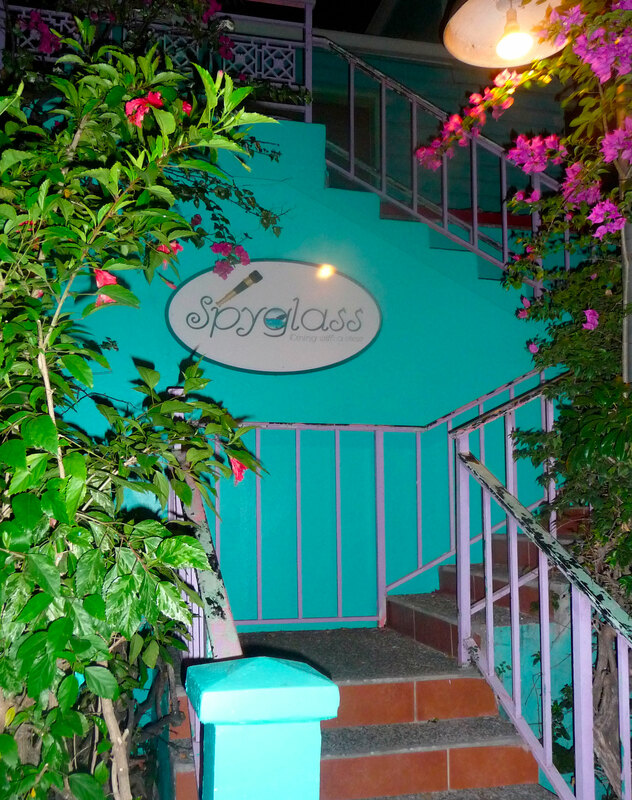 We relaxed for a bit and thought about going back to town during happy hour and give Spyglass a try. When we walked up to Spyglass the bar area was quite crowded. We found two seats on the end and ordered a couple of drinks. The menu was very reasonable for happy hour. I ordered the fish tacos, while my husband ordered the sliders. We also split an order of chicken wings that were priced at $1 each. The food was very good and satisfying. It was a nice early dinner for $29! We then walked over to 420 to check it out. There we watched more coverage on the hurricane on their tvs. It was a nice sports bar. We each had a drink and headed back to the villa. 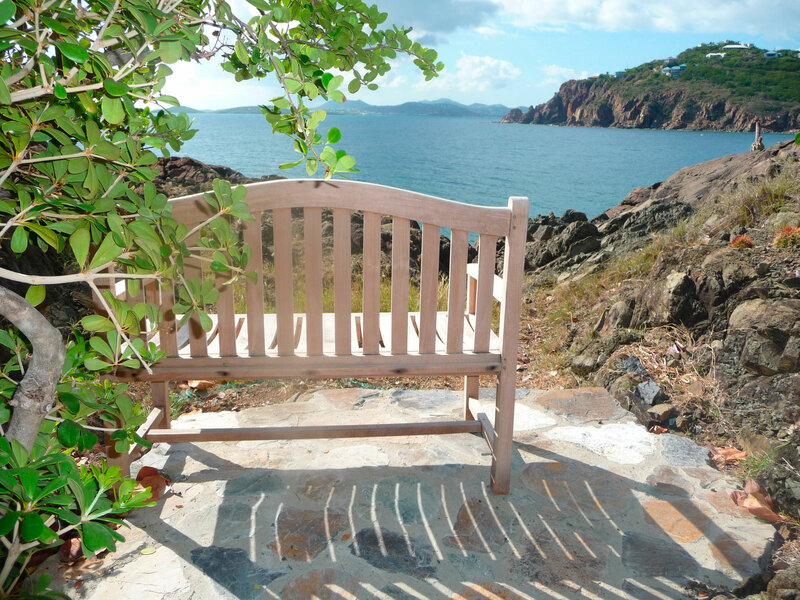 Today was the day our friend Ashley who used to live on St. Thomas would be staying on St. John for a few days for a photo shoot. I also contacted her to see if she could pick me up a memory card. 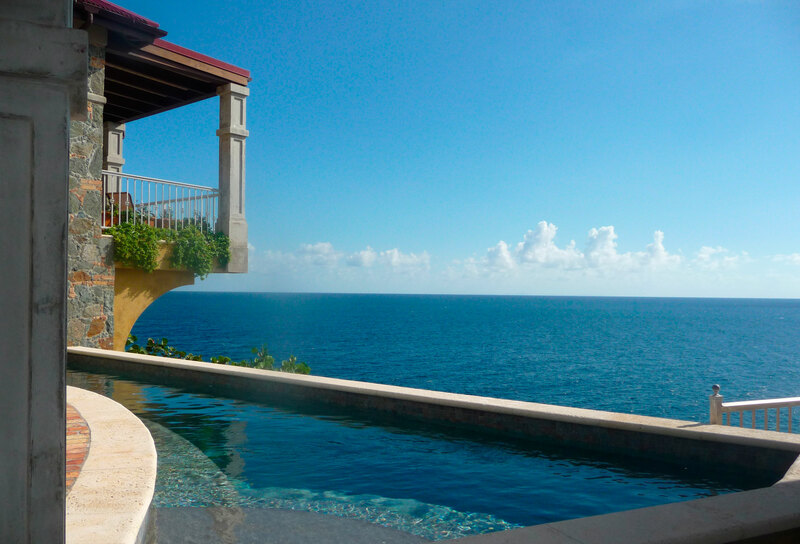 We woke up to another picture perfect day and enjoyed another breakfast at the villa. 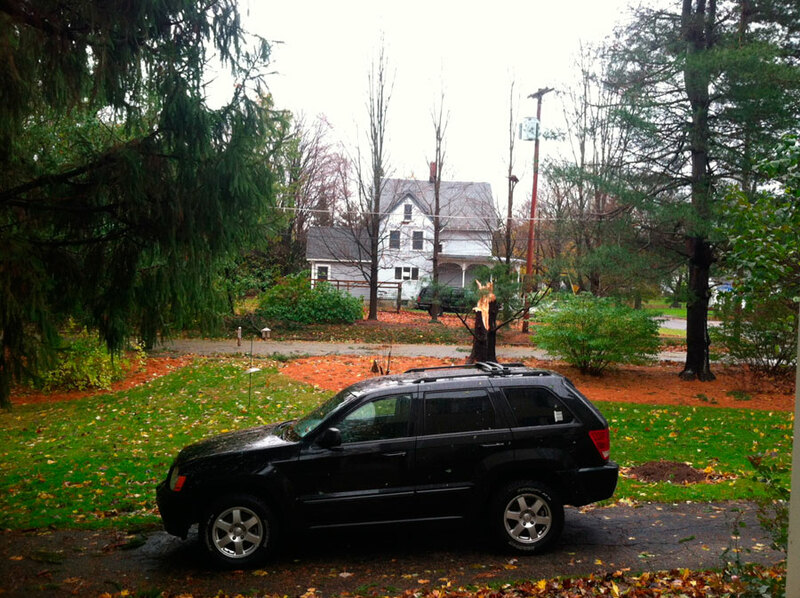 We turned on the tv and couldn’t believe the damage that Hurricane Sandy caused. I tried calling our house back in NJ hoping the answering machine would pick up but it didn’t. I knew we lost power. I couldn’t get in touch with my sister at that point to see how bad it was. My husband tried contacting his brother and they also lost power. Thankfully they had a generator. I finally got a hold of my sister and she said she would try and get to our house later that day to see if there was any damage and check on our cat. 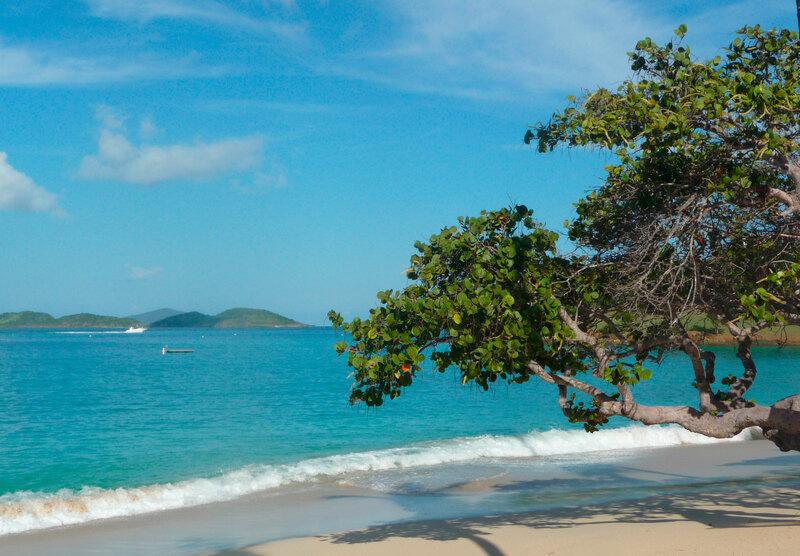 We figured that the best thing was to go out and head to a beach. Maybe Francis? We left the villa and began the drive again up the North Shore Rd. 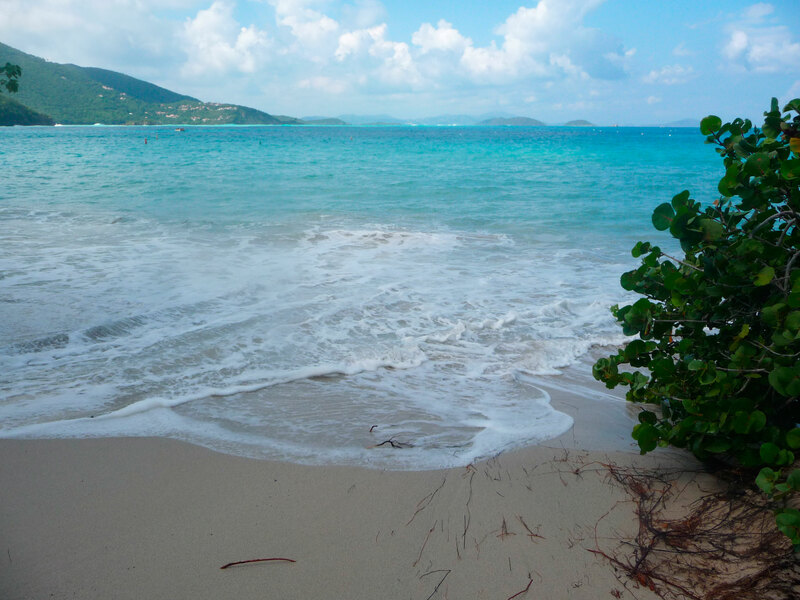 We noticed there was a sign out near Caneel Bay saying “High Surf Advisory”. Here we go again. We only made it to Hawksnest and realized once again, it wasn’t going to be a North Shore beach day. So my husband suggested driving to Coral Bay. We drove along Centerline Rd. and eventually arrived at Aqua Bistro for a cold beer. 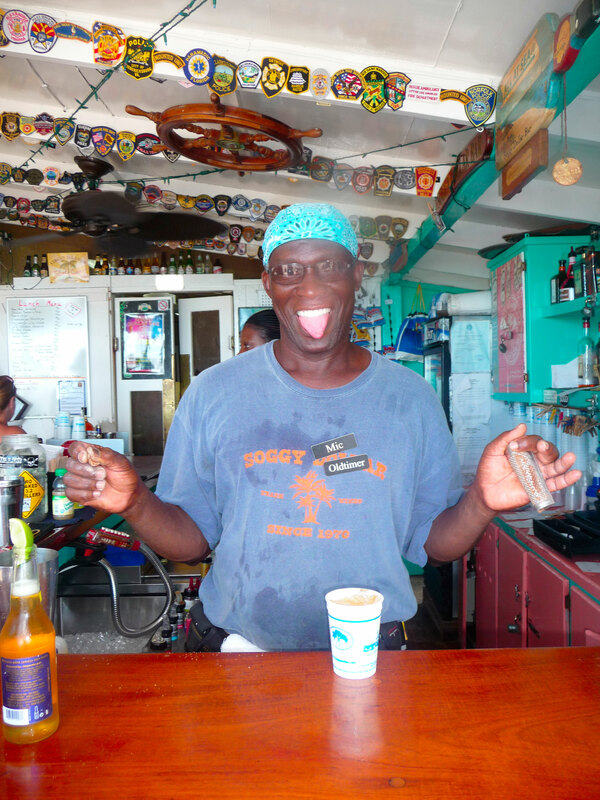 We stopped at the market near Aqua Bistro and grabbed a bottle of Cruzan Rum for $8 – you can’t beat that! 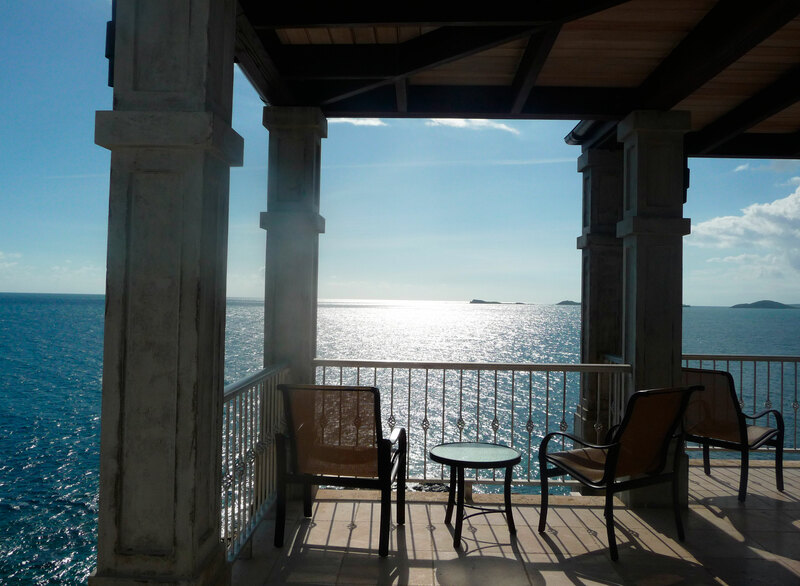 We contemplated driving down all the way to Salt Pond or Great Lameshur Bay, but we figured we would drive back to Cruz Bay because we were going to meet Ashley later that afternoon. 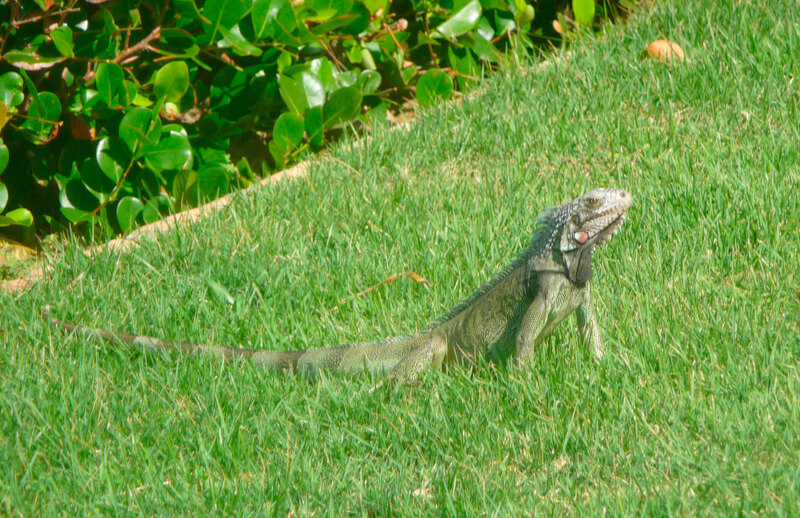 We got back and as I walked down the stairs to the pool area at our villa, a saw an iguana near the pool. I must have scared him because he ran into the pool and then leaped over the edge. The longer we stayed at Wings Over Water, the longer we realized it should be called Iguanas Over Water. There are a lot of iguanas around. We got a kick out of them and most of them tended to hang out on the rocky bluff below and not bother us. I texted my sister to call me on the landline at the villa after she got to the house to let me know what happened. I was trying to relax by the pool but it seemed like a long afternoon. Eventually I heard the phone ring and it was her. I can tell she was so scared but also relieved to tell us we only lost a tree, and luckily it fell onto the street so the town already cleared it. If it fell the other way it would have hit our house and my jeep! She said we had no power and there was a lot of damage in the area with down wires and trees. Our cat was fine so she fed her and headed back home. 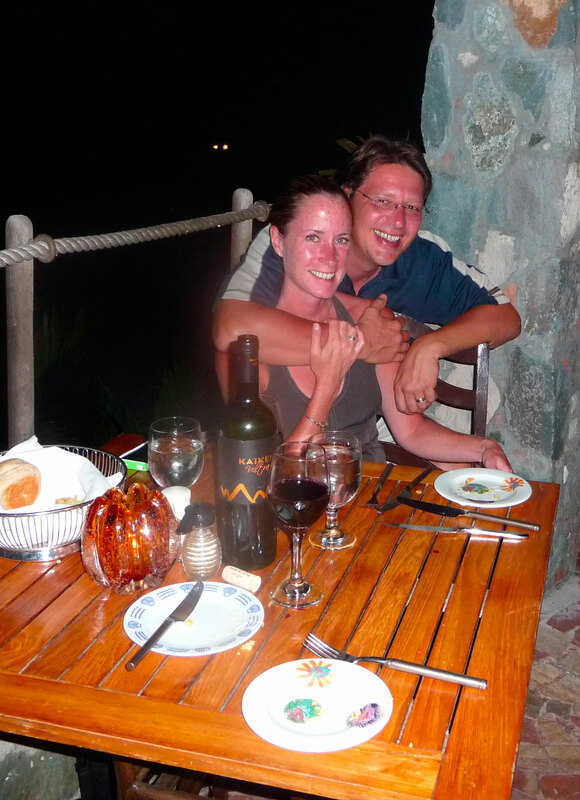 A bit relieved, we freshened up for another grilled meal at the villa. We still had the left over bacon wrapped pork tenderloin and paired it with a nice caesar salad. It was almost time to meet Ashley at the ferry so we drove back into Cruz Bay. 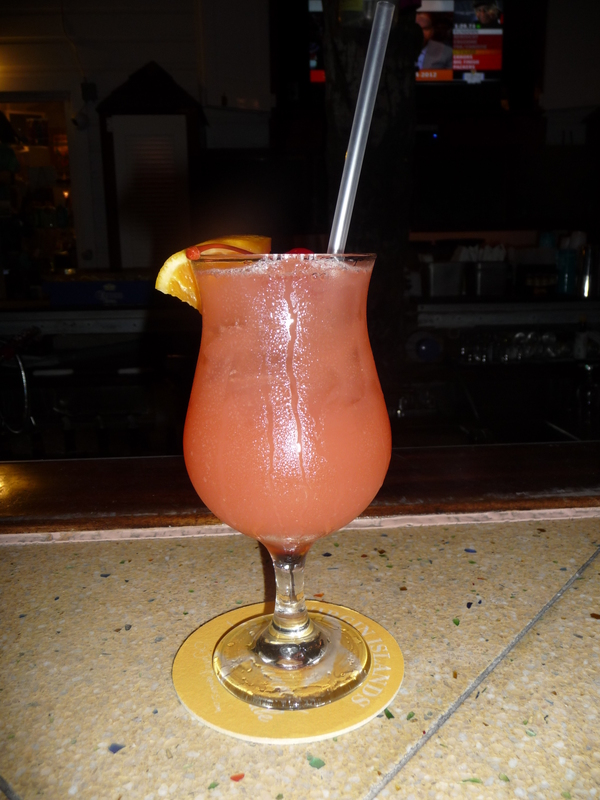 We grabbed a couple of rum punches at High Tide as we waited for her. She finally made it and it was great to see her. And she remember the memory card! 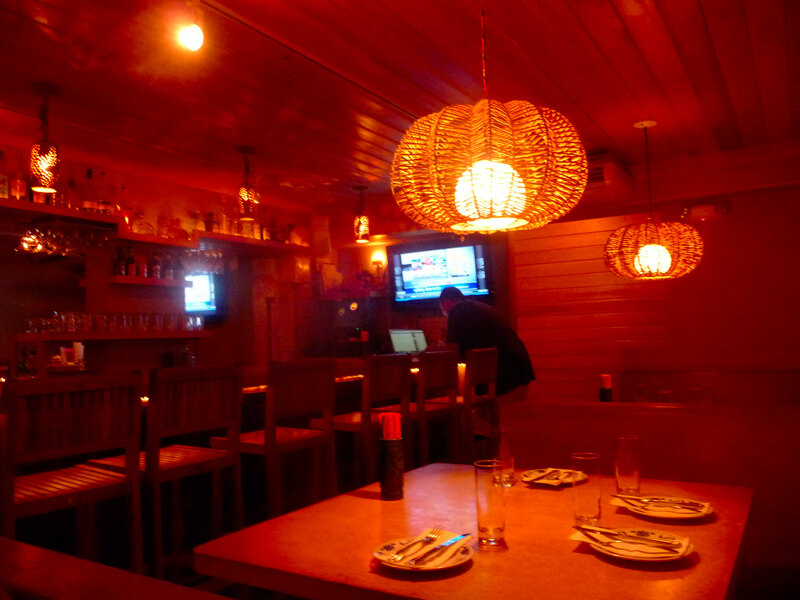 After she checked in at the Inn at Tamarind Court nearby, we went to the Tap Room. They were having their Halloween Party so we saw a few locals dressed up in costumes. I got a kick out of someone wearing a cowboy hat and a Woody’s t-shirt. I wonder who he was supposed to be? Since Ashley didn’t have a rental car, she asked us to pick her up the next morning to look at different beaches for her photo shoot. We told her about the high surf so we thought that maybe a good option would be Caneel. It was getting late and we were all tired so we dropped her off and headed back to the villa. We had to pick up Ashley so we didn’t have too much time for breakfast. We stopped at the Deli Grotto for a great cup of coffee, before stopping by the Tamarind to pick her up. It was a cute little place, reminded me a bit like a B&B you would find in Key West with the chickens and roosters running around. Ashley was ready to go so we drove to Caneel. Being that Caneel wasn’t open yet (they were opening the following day for the season), we had to park on the side of the road. Security stopped us and eventually let us in to walk to Caneel Beach. The beach wasn’t too bad and she thought she could do her photo shoot there. However, the security mentioned that this was their final day of cleaning up before their opening so there would be a lot of activity around (basically don’t use the beach for the shoot). He suggested going to Honeymoon so we walked down to that beach. Honeymoon was the same story as the other beaches – very high surf and little room to walk on the beach. After going back and forth, she wound up going to the Westin to do her shoot. We told her we would meet up with her later for some Halloween bar hopping. 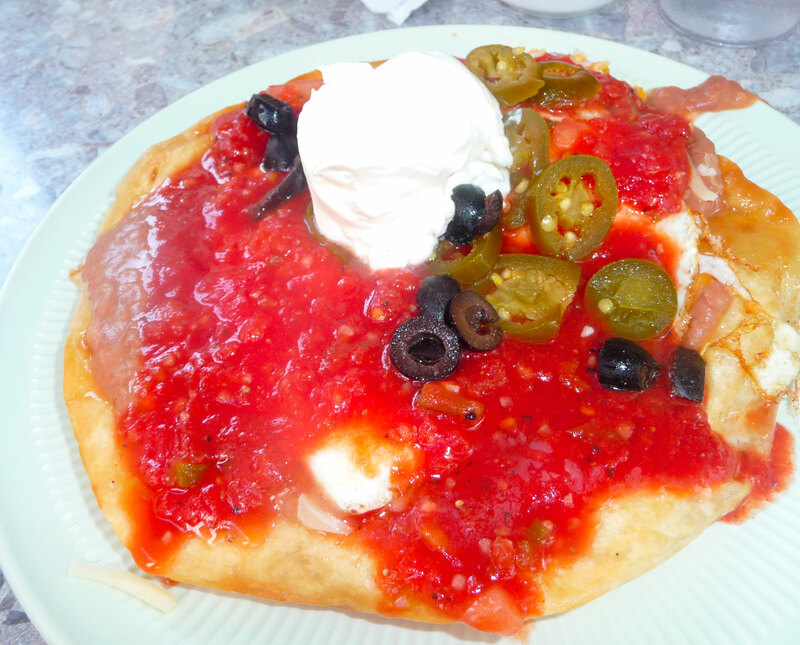 We went to JJ’s Texas Coast for a late breakfast where I ordered my favorite – huervos rancheros. After taking a picture of the sign my husband and I both realized the same thing – after all these years its called JJ’s Texas Coast – and we always thought it was JJ’s Texas Toast?! 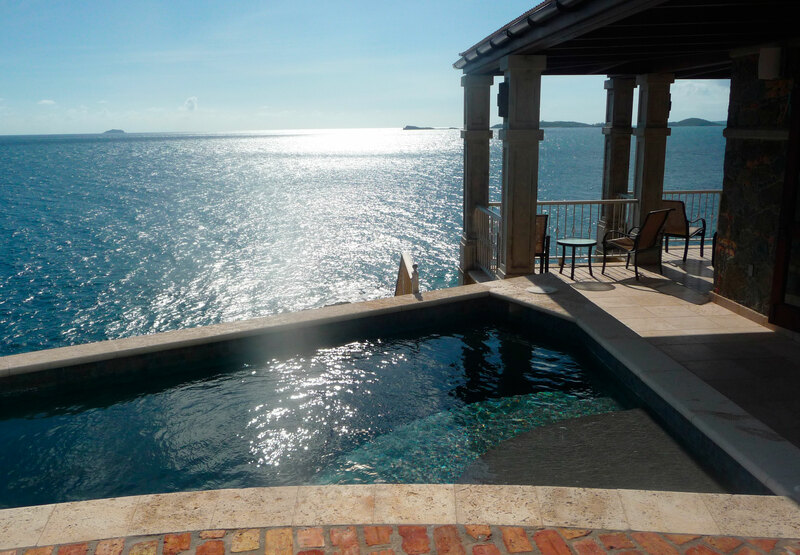 Wings Over Water is such a beautiful villa that we did wind up spending a lot of afternoons there. This was another afternoon where we relaxed. My husband got in touch with our next door neighbor who would let us know if and when we would get power back to our house and he said that it could be between 7 – 10 days! He mentioned about cleaning out our fridge so I called my sister and she was able to do it thankfully. With the uncertainty of when the power was going to come back and knowing we would have the added expense of replenishing our food, I opted to cancel our daysail with Captain Joe aboard the Scubadu. He fully understood and we decided to meet go out to dinner the next night and he would take the ferry over. We then had a few snacks before heading back out for the evening. 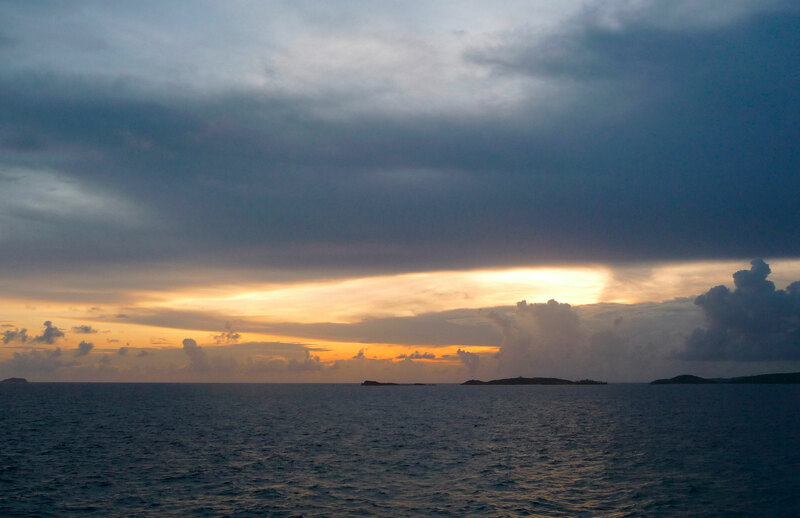 We freshened up and headed back to Cruz Bay. 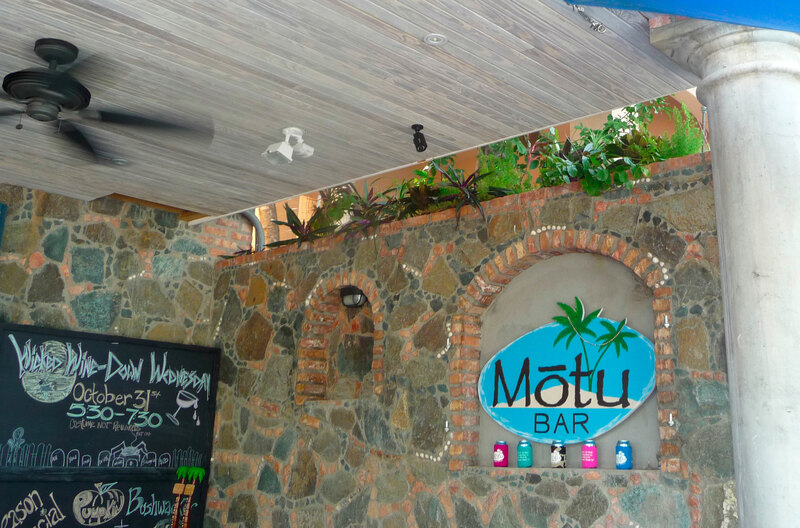 Our first stop after picking up Ashley, was the Motu Bar. It was a lot more crowded that evening then when we were there a few days earlier. Nevertheless, we enjoyed watching the sunset on the nice comfy couches. 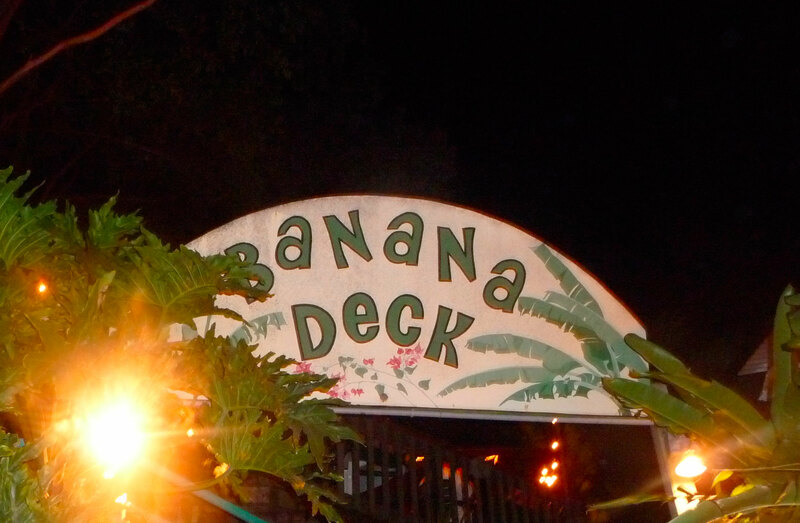 Our next stop was the Banana Deck. 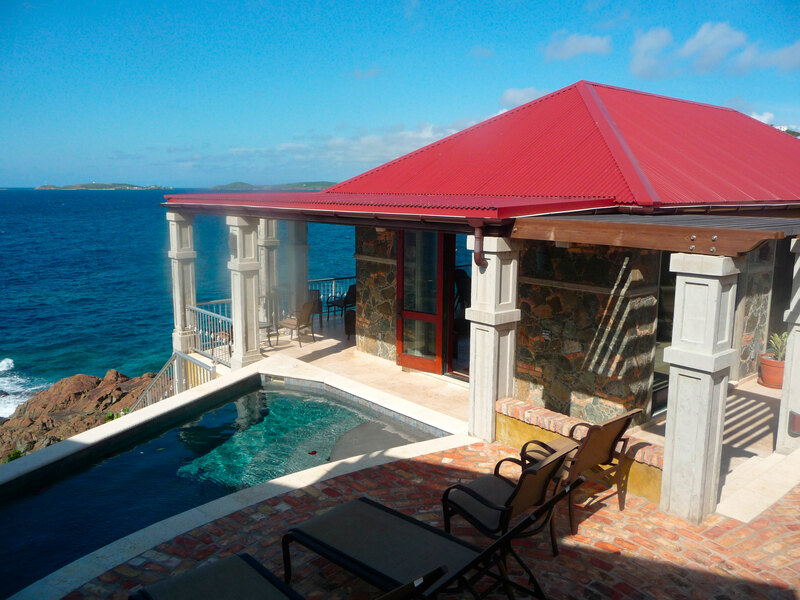 We used to travel to St. John towards the beginning of October when fewer restaurants were open so we were never able to make it to the Banana Deck. We walked over and I was quite impressed with the place. It is set up high over the street with a nice ambiance. The place was pretty quiet so we grabbed some seats at the bar. We ordered some appetizers and enjoyed the place a lot. The last stop for the night was Spyglass. Ashley had never been there so we wanted to go back since we had a good experience a few nights ago with their happy hour. Plus the Beach Bar and Joe’s Rum Hut were very crowded at that point in the evening. We headed up and it was very quiet. I assume they normally get the Happy Hour rush and then most of the crowd leaves. The bartender was nice and friendly as we enjoyed our last stop for the night. I tried his sangria frozen concoction – which was interestingly tasty. We said our goodbyes to Ashley and would try to meet back up with her before we left even though she was going back to St. Thomas. We got home and had some Sesame Soba Noodles we had from St. John Catering (which were really good). 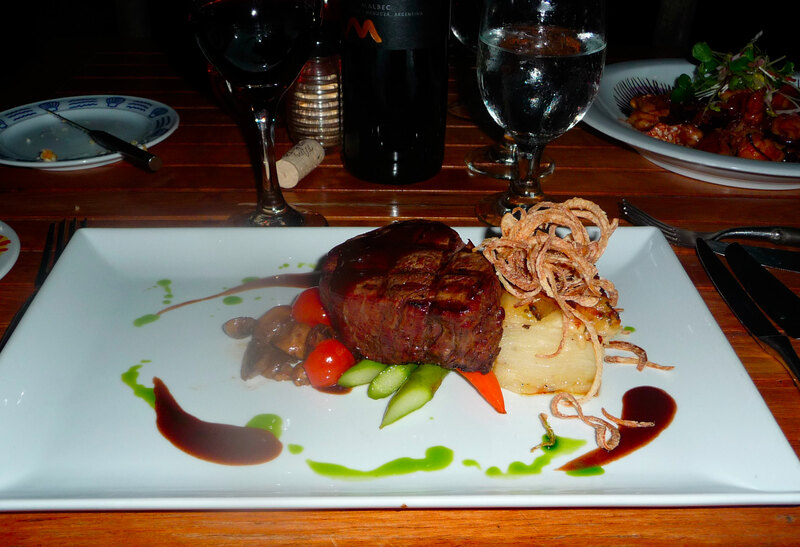 It was great having food available when we would get back to the villa – we were really hungry! Around 7am my husband’s phone went off. He grabbed his phone and it was our neighbor. We got power!! I was so relieved that we wouldn’t be coming home to no power at all. It was a huge weight that was lifted. My husband stayed up to read but I wound up falling back to sleep for a bit. I eventually woke up and made us breakfast to start the day. We heard around the area that the swells along the North Shore should have calmed down by that day so we weredetermined to go. The verdict was Cinnamon since it has a larger beach then the other beaches to begin with. 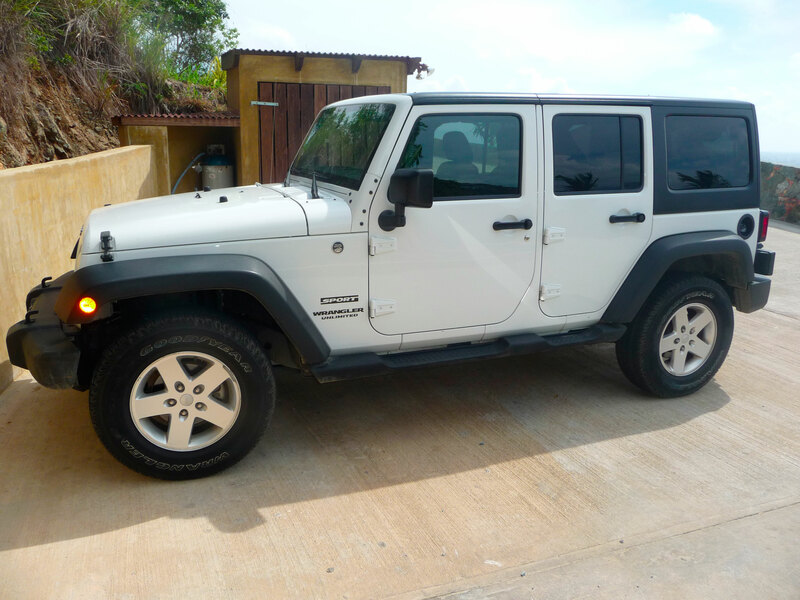 We loaded up the jeep and we were on our way – or so we thought. 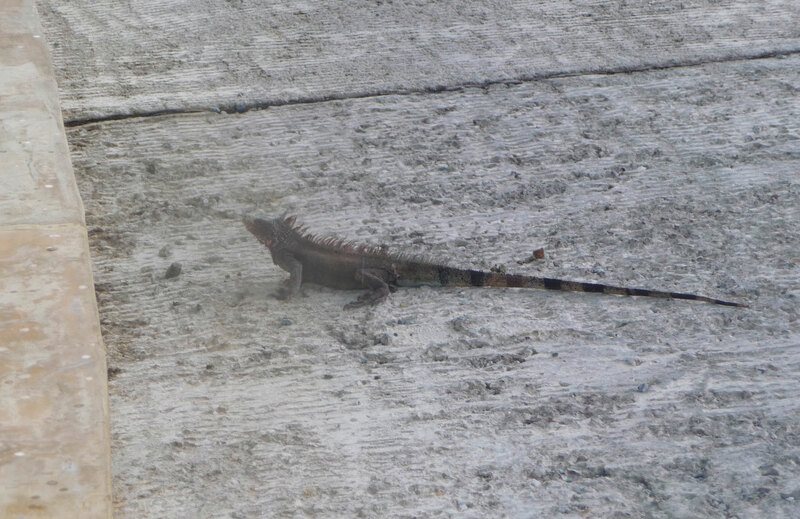 As my husband was driving up the driveway, we hit a road block – an iguana. He would NOT move. My husband was afraid of running over his tail and could not move around him and still get up the driveway. He ran into the villa to grab a couple pieces of apple to lure him away from the middle of the driveway but he didn’t budge. Plan B was to get the pool net/pole and nudge him over to the side of the driveway so we could drive by him. My husband ran to get the pool net and I ran on the other side of the jeep to put it in his hand (like a jouster) and I ran back into the passenger side. We slowly went up the driveway as my husband lowered the net to nudge him over. With a lot of effort, he finally moved over enough (2 inches) so we were able to drive up the driveway. Once again we drove up the North Shore Rd. and saw the High Surf Advisory signs. We wouldn’t be stopped today! We drove by Hawksnest and noticed more vehicles in the parking lot. We made it to Cinnamon where there weren’t many vehicles. We grabbed our things and walked down to the beach. The surf was still high but thankfully there was enough room to set up our chairs. I noticed there were a couple of people in the water but they were all jumping in the waves. No one was snorkeling. The waves were quite high for Cinnamon but we are used to it after spending summers down at the Jersey Shore. We both jumped in and enjoyed the waves. 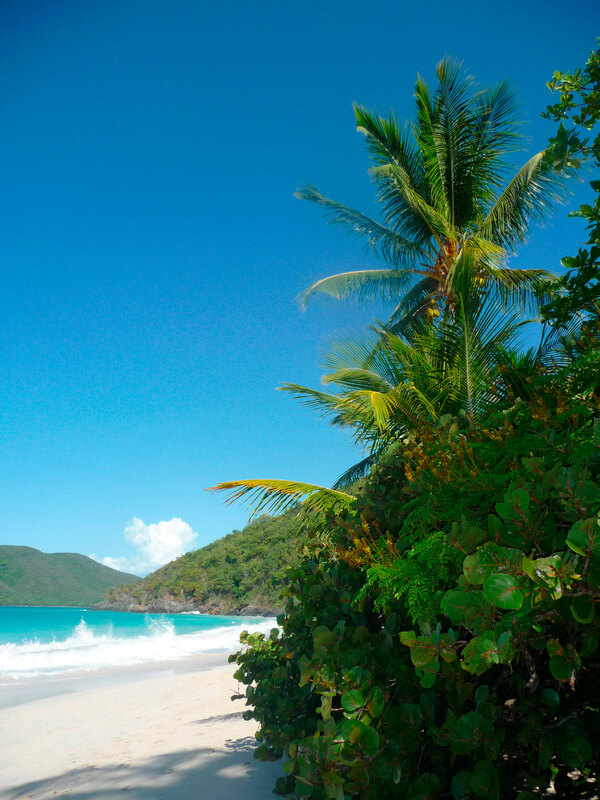 It was definitely a different experience to be had while on one of beaches on St. John. At one point a fairly large wave was coming and I was going to dive through it. My husband said I didn’t have a enough time so I sort of stood there – motionless. Yup – I got nailed! I only hit my knee a bit on the sand so it wasn’t to bad, but after that – I was ready to get out of the water and relax on the beach. It was a beautiful day to spend on Cinnamon. As the day went on, we noticed the beach had a lot more people on it. I guess everyone was missing the North Shore beaches too. It was getting later in the afternoon so we headed back to our villa. On the way I contacted Captain Joe and he said he could make it over on the 5pm ferry. No problem. 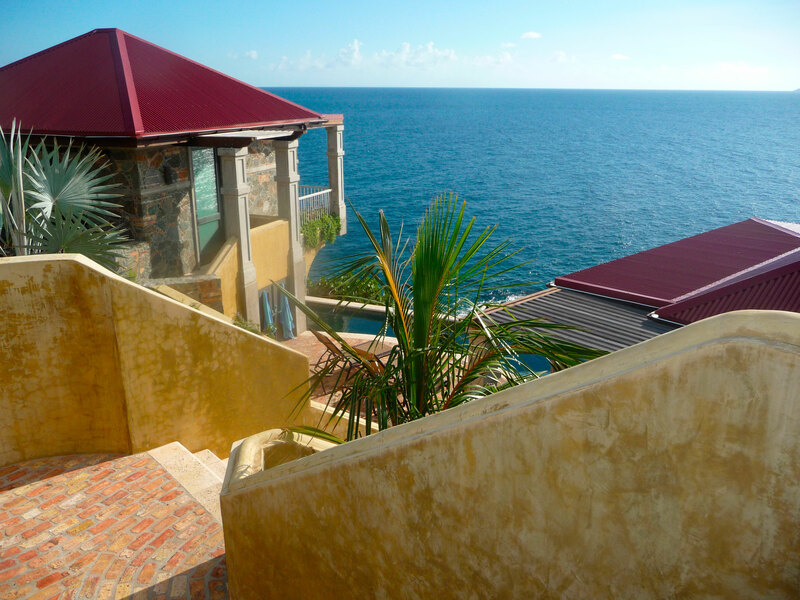 When we got back to the villa, I started to walk down the stairs and immediately stopped. The same iguana from before was on the stairs. He was a big boy too. We still had the pool net so I grabbed it and nudged him down the stairs. 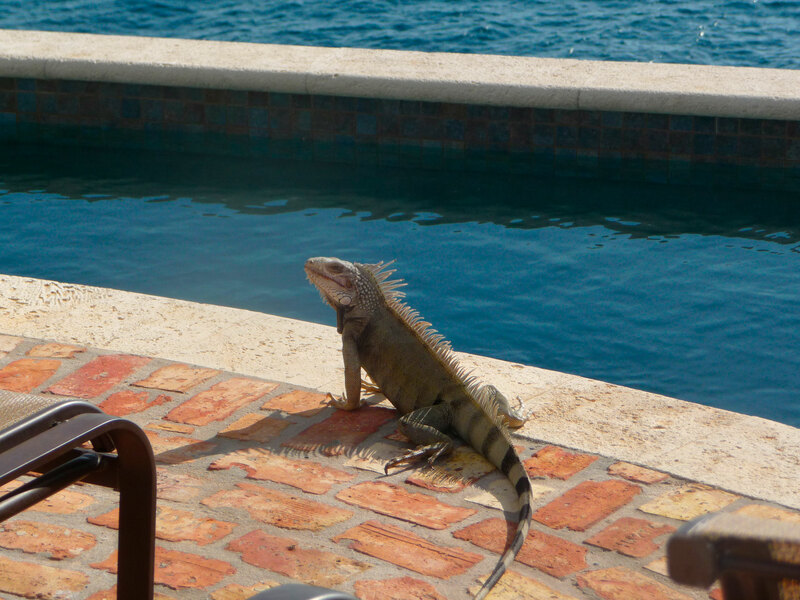 He finally made it by the pool and like the previous iguana, jumped in the pool and leaped over the other side. He was stubborn fellow! After freshening up we went back to Cruz Bay to wait for Captain Joe. 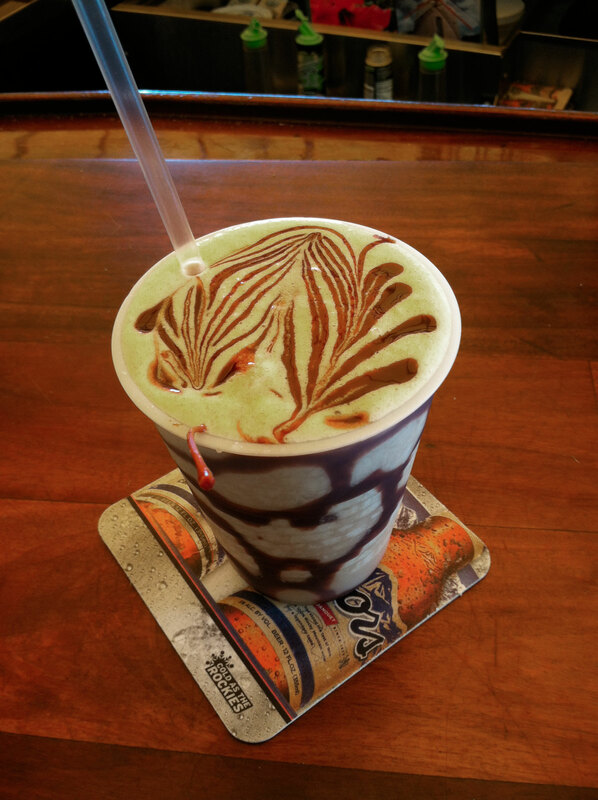 We went to High Tide for a couple of Rum Punches, which during happy hour are only $4 a piece. 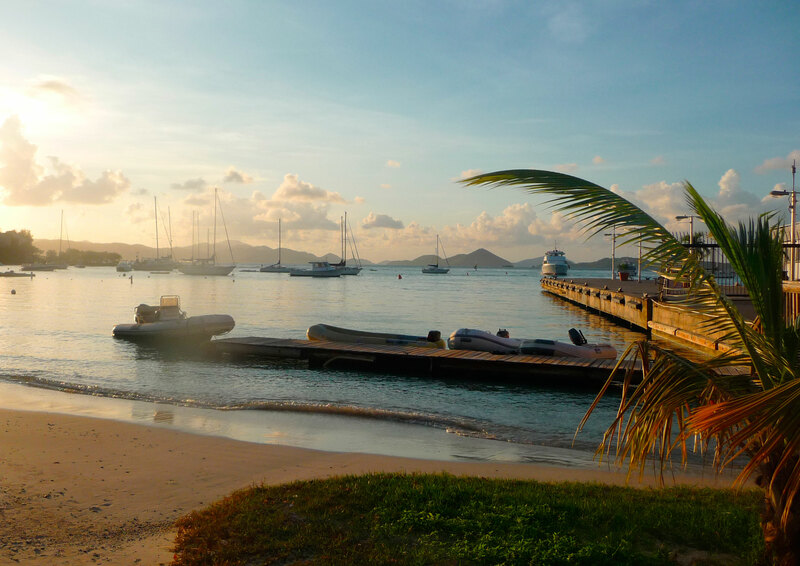 As we waited for Joe, I took a few pictures of Cruz Bay as the sun was setting. He arrived with a huge grin as always. It was great to see him again. After some discussion we figured we would go to Fatty Crab for dinner. I always wanted to try this place, and after seeing the chef on the Food Network’s show Chopped. We walk up and it was practically empty so there was no problem getting a seat. The hostess sat and our server then came over to tell us how it worked. You would basically pick a few items on the menu and they would bring it out one at a time while everyone tries it (similar to tapas). Sounded like fun – so we gave it a try. 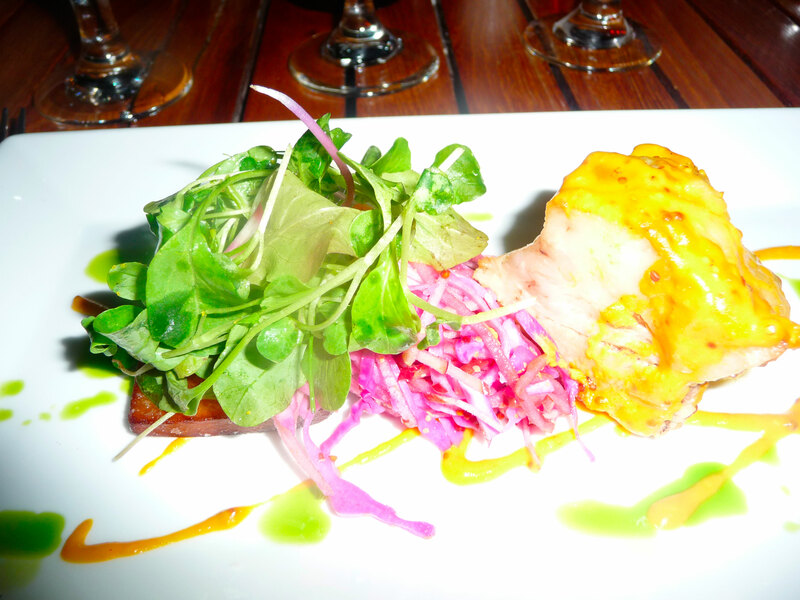 For the first course we had two orders of the fish fry sliders – which were amazing – made with fresh wahoo. 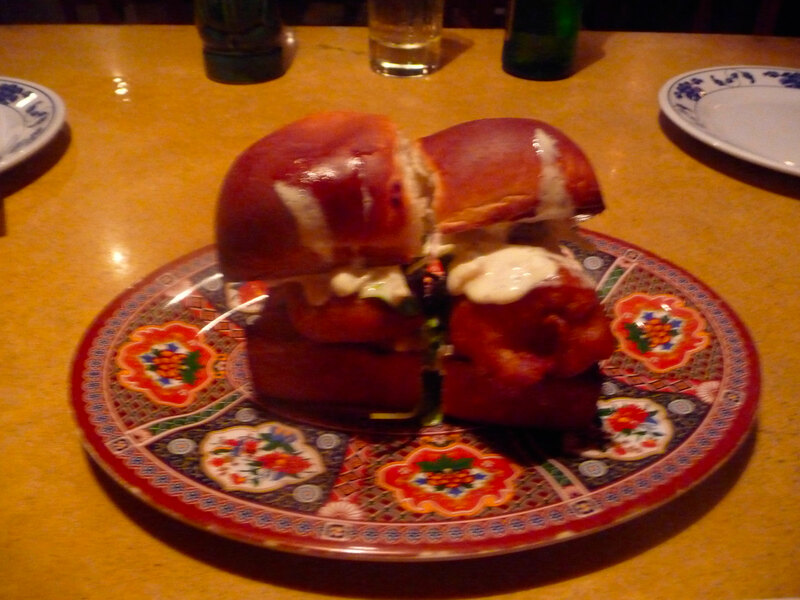 The next course was an order of the soft shell crab sandwich, followed by pork spare ribs. All were eaten too quickly before I could take a picture. 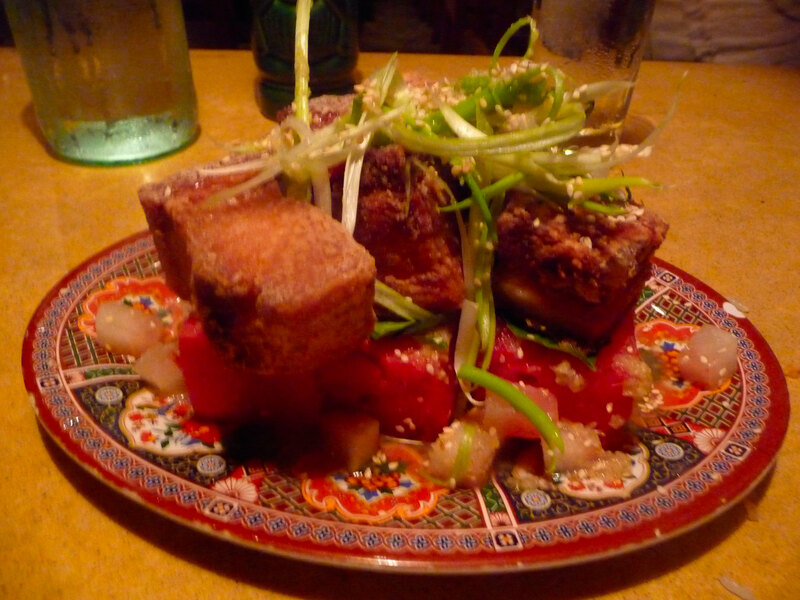 Following the ribs, we had the watermelon pickle and crispy pork belly which was delicious. 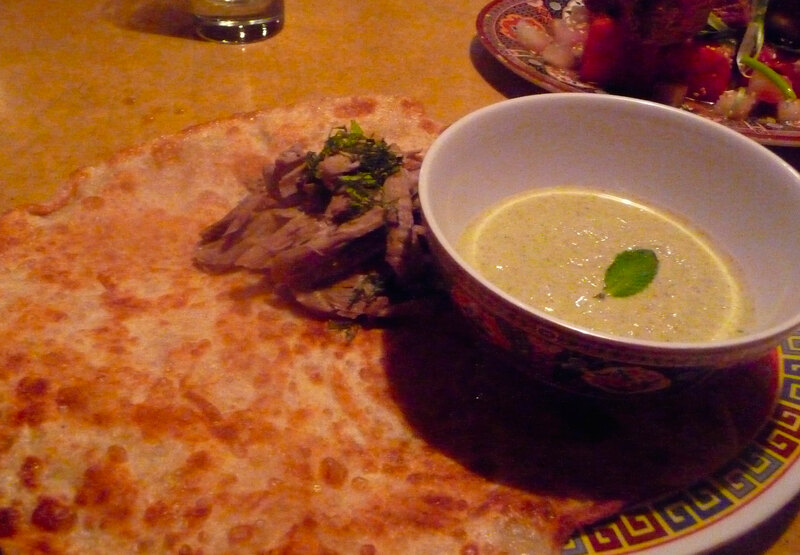 The last course was a pulled leg of lamb with a mint curry yogurt served on a roti. 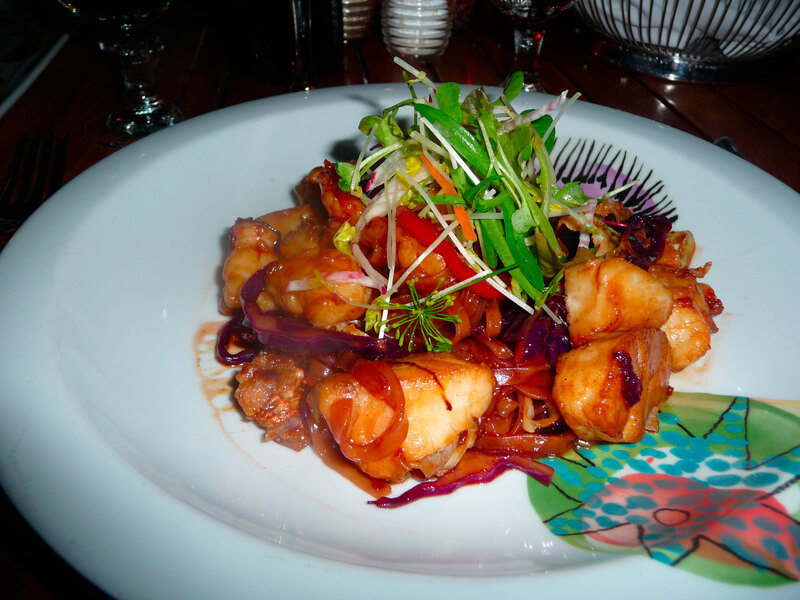 I highly recommend checking out Fatty Crab while on St. John. We gave Captain Joe a big hug and reassured him we would be back next year. We slept in a bit later this morning since we knew we would be getting up early the next day when we had to leave. 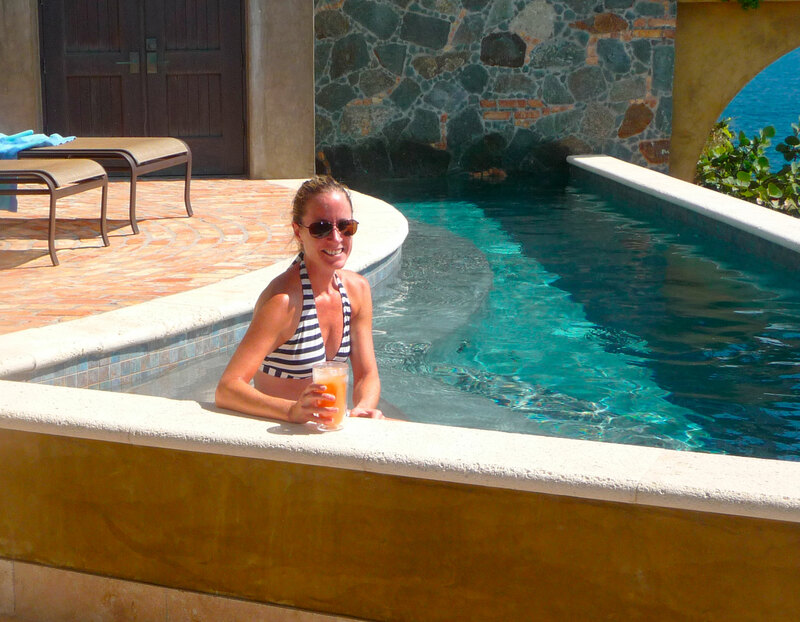 After a few cups of coffee we decided to relax at the villa for the day. It was a wonderful day watching the boats go by and laying by the pool. 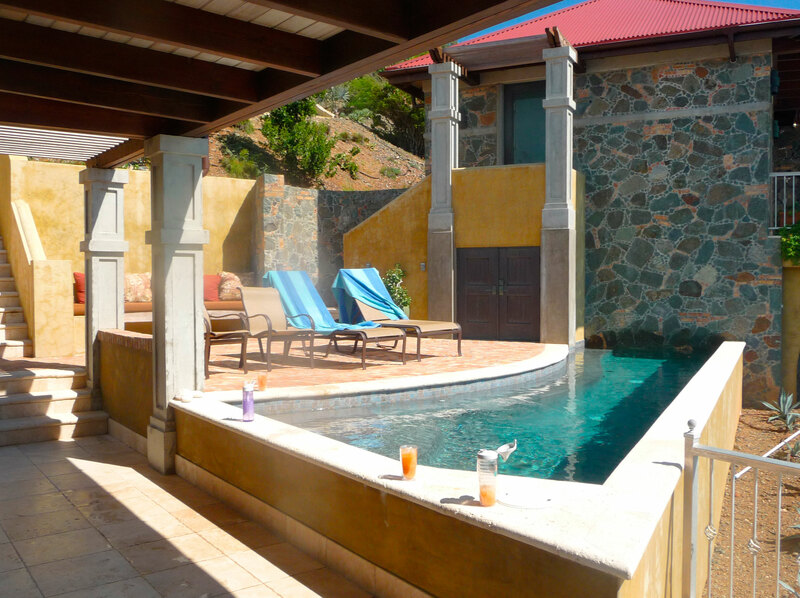 The pool is on the smaller side, but its large enough to cool off in. Originally we were going to have Ted cook for us from Ted’s Supper club, but again, to save some money we decided to cancel. 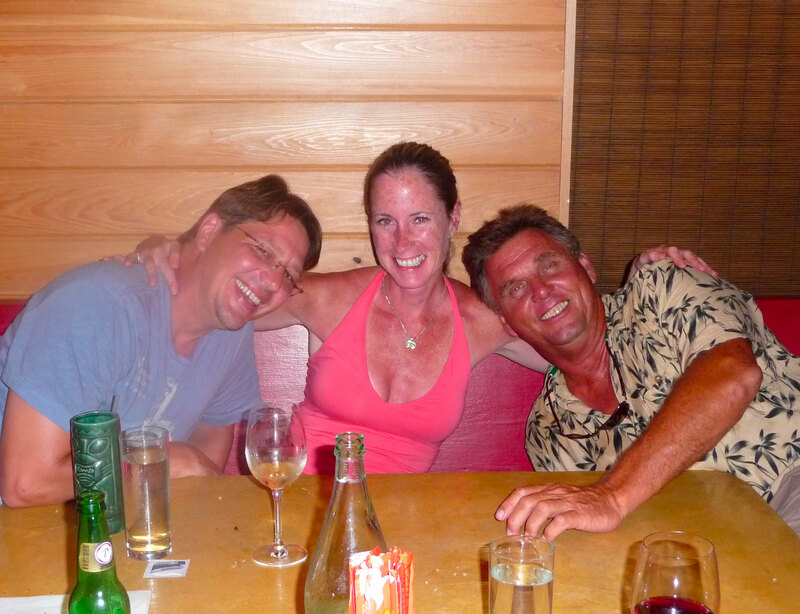 The night before we had reservations to go to the Sugar Mill (formally the Equator) Restaurant at Caneel Bay for my belated birthday dinner, but rescheduled after going out to dinner with Captain Joe for our last night. This was Caneel’s second day being open for the season so I was excited to go back and see it. The last time we had dinner there, it was cut short by Hurricane Omar. We hadn’t been back since–We drove into town and parked the jeep in the free parking lot and decided to take a taxi to Caneel. We figured it would cost about the same taking a taxi vs. parking at Caneel. We stopped for one last rum punch at High Tide before grabbing a taxi. Once we got to Caneel it was already dark. The Sugar Mill looked pretty much the same as the Equator. We were greeted with a warm hello and sat right a long the edge to watch the lights on St. Thomas. 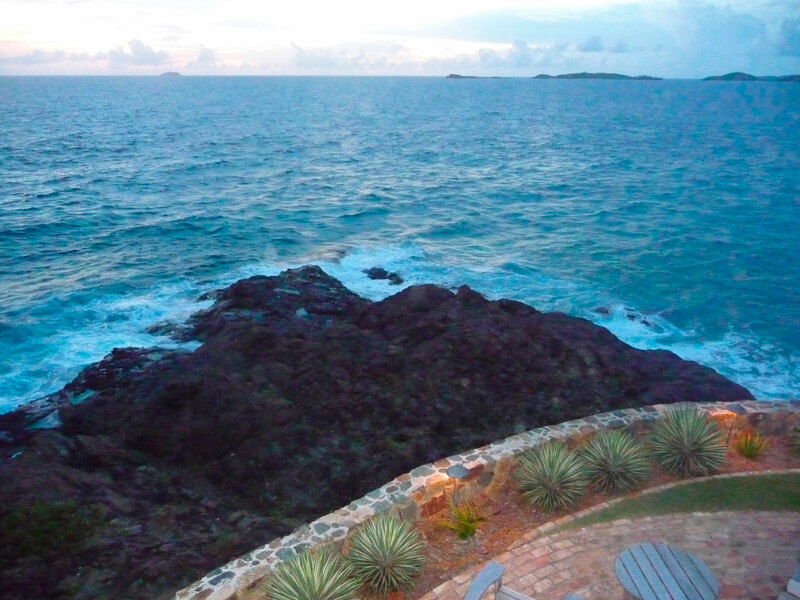 It was a beautiful setting to spend our last dinner on St. John. 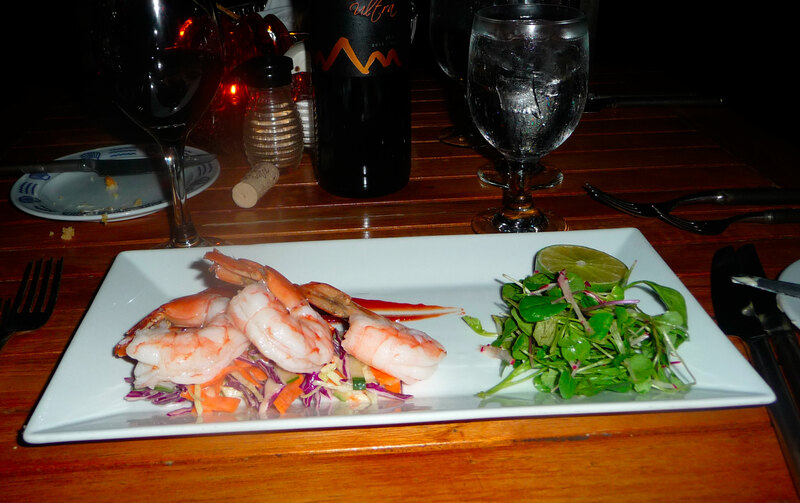 My husband started off with the shrimp cocktail while I had their version of pork belly. Both were very good. For our entrees, my husband ordered the filet and I had the seafood pad thai. 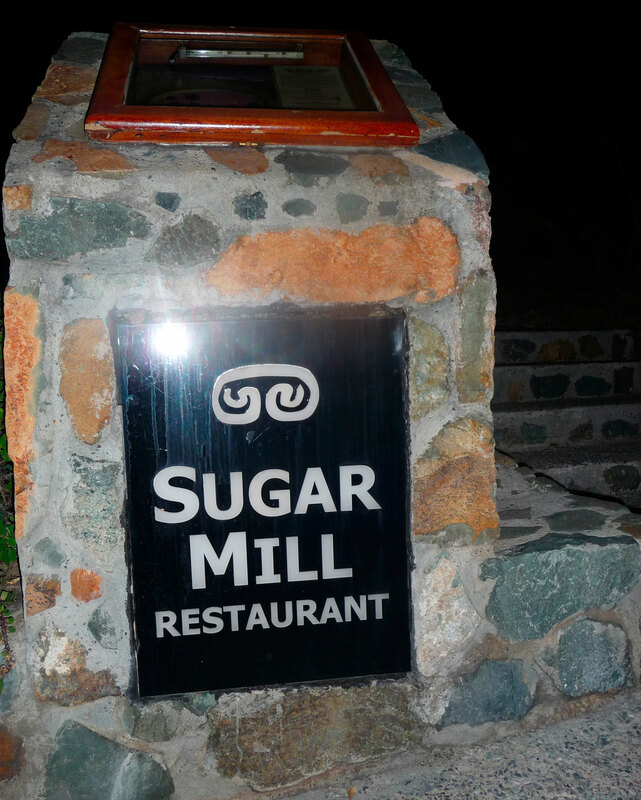 We had a great dinner at the Sugar Mill and it brought back a lot of wonderful memories from our past vacations at Caneel. After dinner we strolled along the grounds to check out our old room, Cottage 7E. We weren’t supposed to walk there but it was very quiet so no one bothered us. We walked back and managed to get a taxi fairly quickly to take us back to town. 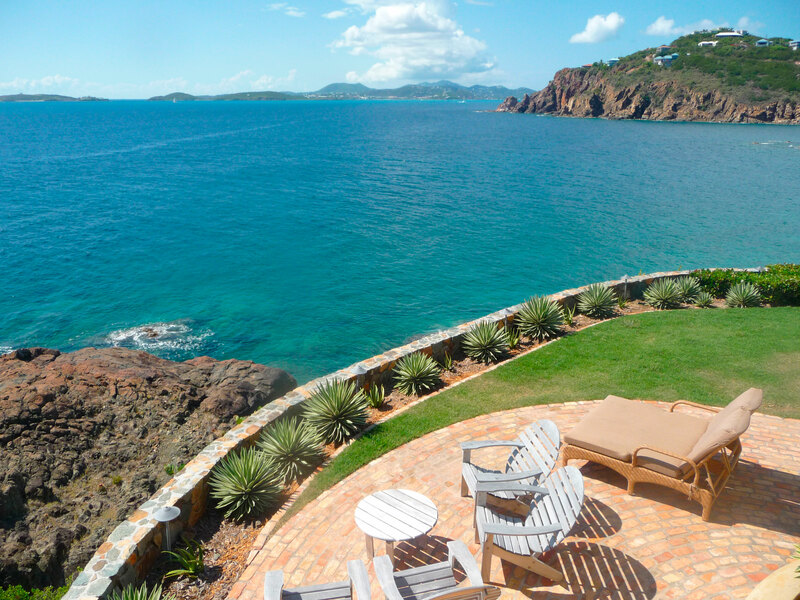 Once back, we want to have one last night cap somewhere on St. John. 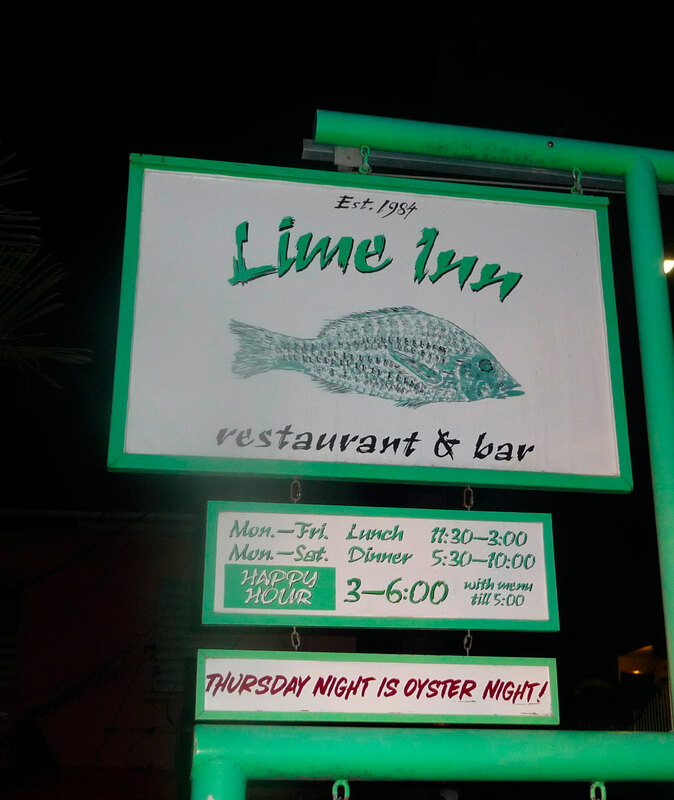 We had never been to the Lime Inn before and saw that their bar was open. Again, this restaurant is usually closed while we are on St. John, but knowing the owners formally part owned the restaurant Chesapeake Bay in Long Valley, NJ (that my family used to frequent many years ago), I wanted to stop in. We walked over and no one was there. Eventually the bartender, Tyler came out. He was very nice and talked to us while we drank our beer. He even gave us our round on him! We thanked him and walked back to our jeep. 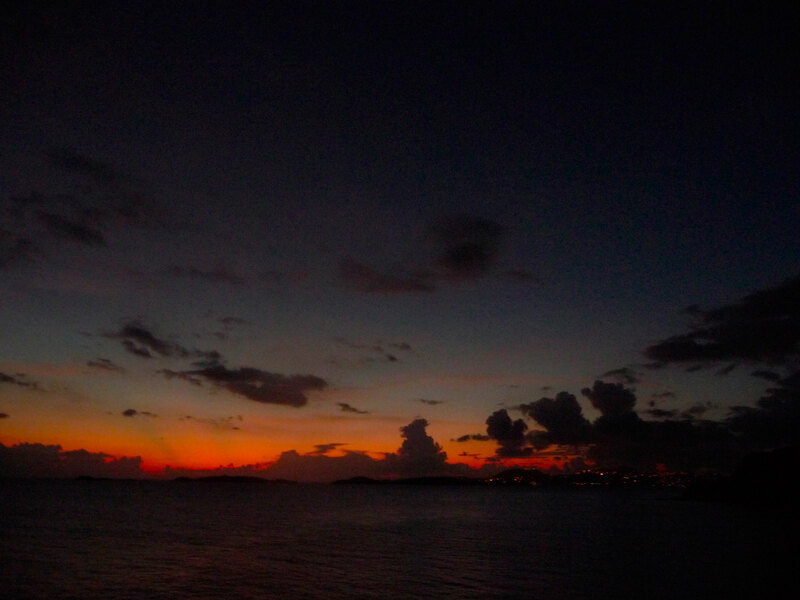 It was the last night heading out of Cruz Bay and back to our villa. We got back to the villa and called it a night. We got up early to spend some time cleaning up the villa and doing laundry before leaving the villa. We enjoyed some cups of coffee and packed our things up. After we returned our rental we walked down by the ferry dock to get 2 tickets for the 10am ferry. We walked back over to JJ’s to have breakfast. We noticed a lot of people at JJ’s with their luggage by their side. 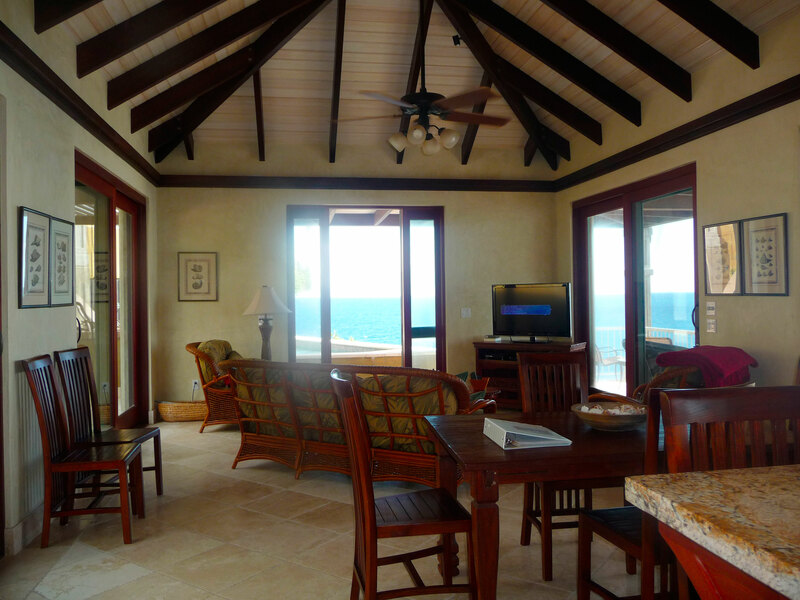 I guess Saturdays are the busiest days when people leave/come in since that is the majority of when villas are rented. 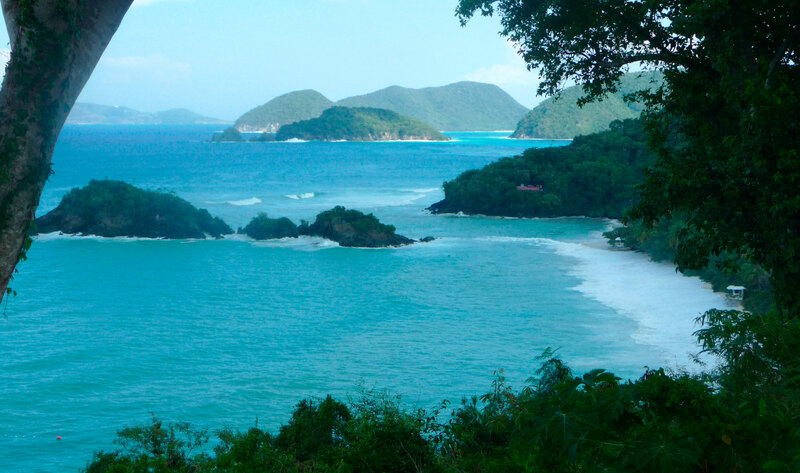 Soon it was time to go on the ferry and leave St. John behind. The ride over was nice and calm. We arrived at Red Hook and then got on the taxi/van to take us over to the other side of the island where the airport is. It was a long ride and very hot. The AC needed to be charged and I don’t think the taxi driver was aware of it until one of the passengers mentioned it to him while we were leaving. Eventually we made it to the airport. Our flight was on schedule and left on time. As we neared Newark Airport I could see areas down below of lights and areas of black. It was kind of bizarre to see. We landed about a half hour late (big surprise). It was freezing when we got off the plane. It was a big difference from 88 – 92 degrees to 40 degrees! My sister was originally supposed to pick us up, but with the gas situation she wisely conserved her gas and stayed home. I was able to get our normal car service to pick us up. It was a relief to see him waiting for us. We grabbed our luggage and headed home. We noticed all the gas stations that were closed and the ones that were open had very long lines of cars with police stationed at them. Thank you again for reading my report. For a 2nd straight year we have missed a major storm while on St. John. 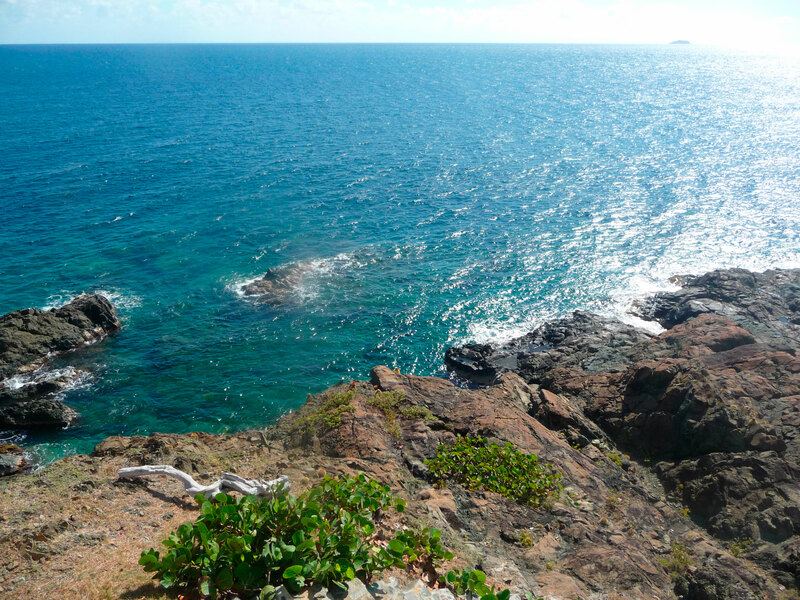 I think it will be a good idea to head back down again, the same time next year to St. John!